Helping survivors heal. That’s been the mission of the YWCA of Western Mass. for 150 years. Today, the agency does this in a number of ways, some well-known, such as its 58-bed domestic-violence shelter, and others far-less-heralded but still important, such as helping area young people attain their high-school equivalency. In each case, the key is providing these survivors with the tools they need to achieve a higher quality of life. Azreal Alvarez calls this his third crack at high school, or the equivalent thereof. That’s how he referred to YouthBuild Springfield, a workforce-development initiative operated by the YWCA of Western Massachusetts, a program that is succeeding where the first two stops didn’t. Indeed, Alvarez said that, when he attended one of Springfield’s charter schools, he was bullied so much, he couldn’t stay in that environment. Later, he enrolled in what he described as an online endeavor that didn’t inspire him in any real way. That left YouthBuild as a last hope that soon became his best hope. The program is designed to not only help young people get their high-school equivalency, but also become introduced to careers in construction or healthcare. 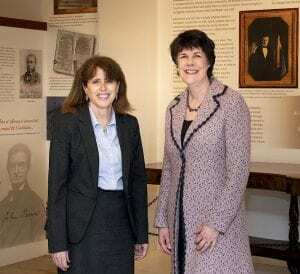 With that, whether he knew it or not, Alvarez neatly summed up the first 150 years of the organization now known as the YWCA of Western Mass., the 10th-largest YWCA in the country and one of the oldest as well. Since Ulysses S. Grant patrolled the White House, it has been helping people find a light that, yes, is often hard to explain, but very often leads to a higher quality of life. And that light comes in many different forms, said the agency’s executive director, Elizabeth Dineen, a former prosecutor and supervising district attorney in Hampden County who spent more than a quarter-century handling special-victims cases including those involving child abuse, sexual assaults, domestic violence, and murder, and was recruited to lead the YWCA by several of its board members in 2016. It might simply be a voice at the other end of a hotline that operates 24/7 and handles more than 10,000 calls a year, she told BusinessWest. Or it might be the peace, safety, and opportunity to start a new and better life that all come with a room in the 58-bed domestic-violence shelter. Or it might be the enlightenment gained through one of the agency’s newer counseling programs, called Children Who Witness Violence, an ambitious undertaking aimed at preventing domestic abuse, sexual abuse, and other forms of criminal behavior from becoming generational. Or it might come in the form of exposure to a career in the medical field or construction, something a young person might never have considered as they were struggling with traditional high school, said Dineen, adding that YouthBuild and related programs are solid examples of how the YWCA has evolved and expanded well beyond its original mission and even the ‘W’ in its name. All of this is what the agency is celebrating as it marks its sesquicentennial, an ongoing story that is driven home by the case of Linda Anselmo, who came to the agency last year at a time when she had nowhere else to turn. A recent transplant to the area, she found herself the subject of intense and relentless verbal and emotional abuse from her partner, who, among other things, “threated to commit suicide and take me with her,” said Anselmo, noting that she was lost and alone when she found the YWCA, but never after that, thanks to the agency. Fast-forwarding, she said the agency helped her find temporary housing in a shelter and then transition to permanent housing in a community she chose not to disclose. More importantly, perhaps, the YWCA helped her move on from what happened to her emotionally. Helping people learn how to heal would be a good way to describe what Dineen and her staff of 150 do 24/7/365. For this issue and its focus on area nonprofits, BusinessWest takes an in-depth look at how the agency does just that. That’s the word those at the YWCA use when referring to the various constituencies they serve. It works much better than ‘clients’ or ‘residents’ or any other collective that might come to mind. That’s because all those who come to the facility at 1 Clough St. (or who simply call the hotline number) are survivors — of domestic violence, sexual assault, child abuse, bullying, human trafficking, stalking, or a combination of the above. They find this YWCA, which serves communities in both Hampden and Hampshire counties, because, while they have survived what has happened to them, they are still in need of a great deal of compassionate help as they seek to put their lives back together. Providing that help has essentially been the mission of this agency for the past 150 years. 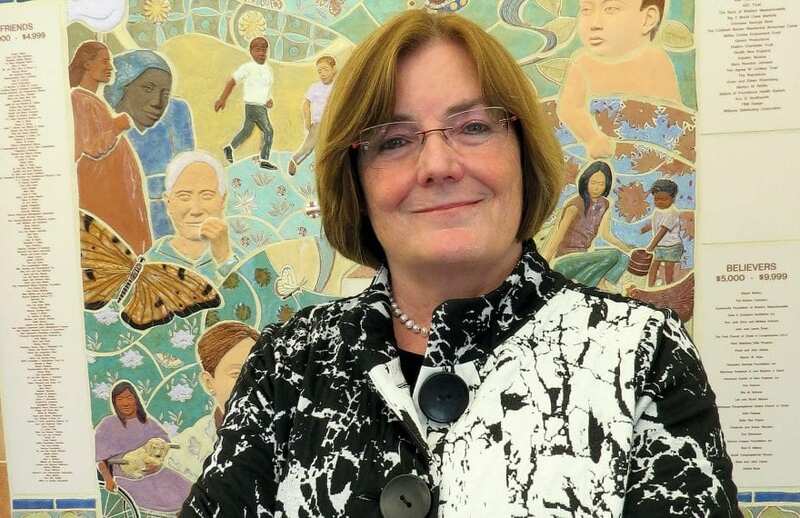 “I love this job because we’re able to serve women and children who are desperate to receive professional services, so that they can move on with their lives,” said Dineen, who has made a very smooth transition from the courtroom to the classroom (she chaired the Criminal Justice department at Bay Path University for several years after leaving the DA’s office) to the challenging world of nonprofit management. Indeed, while the work address and the title on her business card are different, Dineen is, in many ways, continuing the work with survivors that marked the first 25 years of her career, work she described as both extremely rewarding but very challenging. 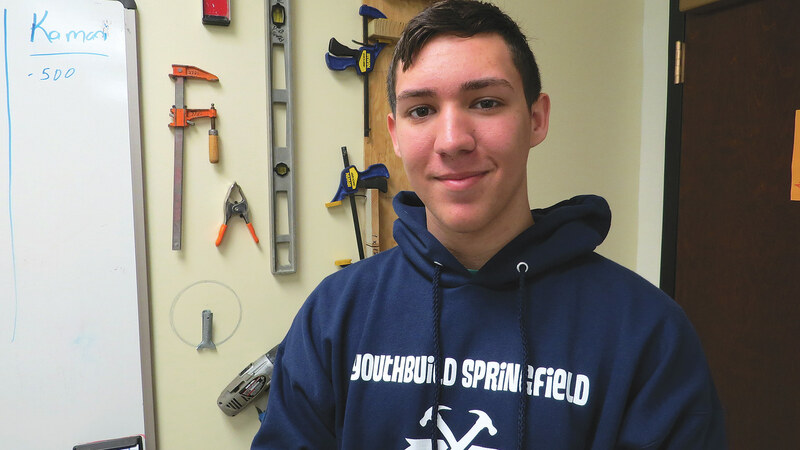 Azreal Alvarez says the YWCA’s YouthBuild Springfield program is his third crack at high school, and his best chance to succeed. “When you win a case, it’s very rewarding, but when I lost a case, it was excruciating, because you knew the person was going to be released to the community and would re-offend,” she explained, providing some unique insight into a realm few really know and understand. “Overall, these are some of the most challenging types of cases to prosecute. 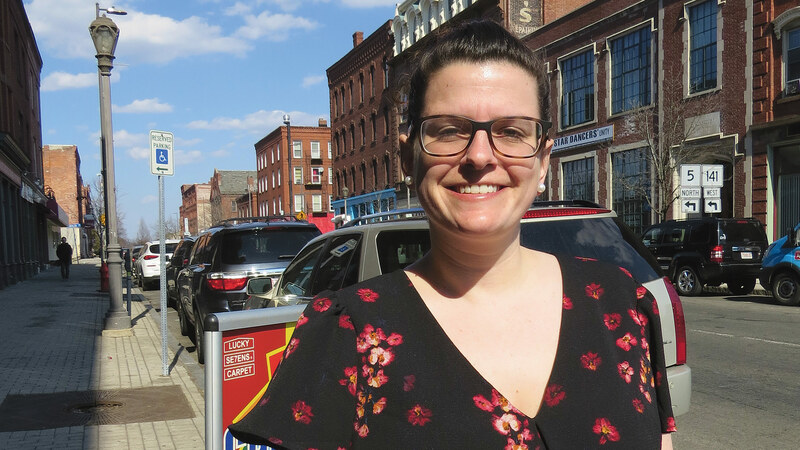 Dineen said her work in the DA’s office, which focused on high-profile cases including child-abuse murders, domestic-violence murders, and sexual-assault cases, has benefitted her in a number of ways as she guides the YWCA. For starters, she has a number of connections with area law-enforcement agencies and the legal community, connections that ultimately help her and her team better serve survivors. 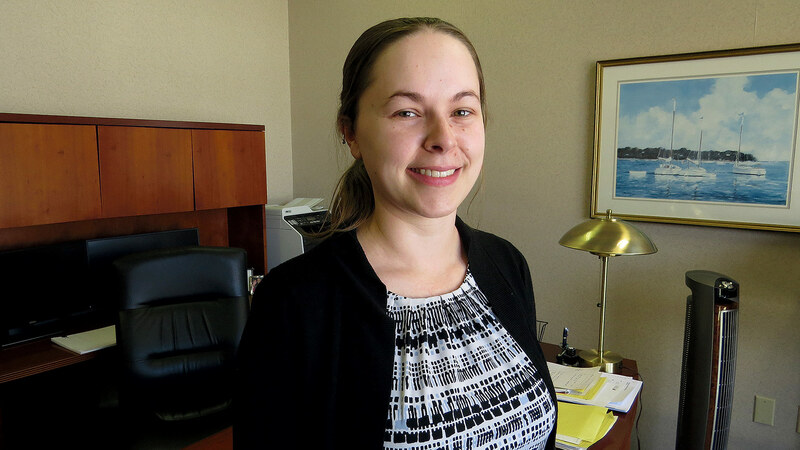 Meanwhile, her time in law school and then as a lawyer has certainly helped her handle all the contract work that is part and parcel to managing a nonprofit these days, and especially this one. But the greatest benefit from her work as a prosecutor is gaining a deep and unique understanding of what survivors go through — and what services they need to move forward with their lives. This perspective has helped in the development and refinement of a number of programs and initiatives, and it comes across clearly as she talks about facilities such as the domestic-violence shelter, which is filled 24/7 as evidence of what she called an epidemic in this country and this region. She knows about the women and families who come there because she’s operated in their world throughout her career. “When women come to the shelter, they come very often with just the clothes on their back,” she said, adding that only those deemed to be in eminent danger are assigned rooms. “If they bring anything for their children, it’s usually some kind of comfort object like a blanket or a toy. “Many women come here right from the hospital or a police station, or they come here when there’s an opportunity to flee their abuser,” she went on. “The person might be going to work or to the supermarket, and there’s a window of opportunity that the woman has to literally flee their abuser. Thus, when they arrive, they need a full array of services, said Dineen, listing everything from direct counseling to getting children into schools or daycare as soon as possible, for their benefit, but also to help staff members focus on helping mothers prepare for the day when they will leave the shelter; from work to secure, permanent housing to assistance with entering or re-entering the workforce. To accomplish all this, the YWCA works with a host of partners, from area school departments and daycare providers such as Square One to Way Finders (for housing and employment services) to Dress for Success (to ensure that women have suitable clothes for an interview or the first day on the job). 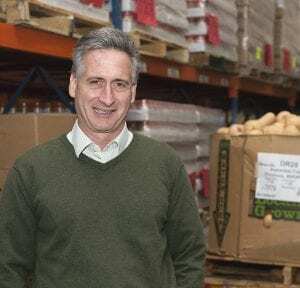 This independence and self-sufficiency almost always comes through employment, Dineen went on, noting that many who come to the shelter have been out of the workforce for some time and thus need help to re-enter it. Thus, the YMCA has a computer lab and services to help survivors write a résumé and cover letter, apply for jobs online, and conduct themselves at an interview. 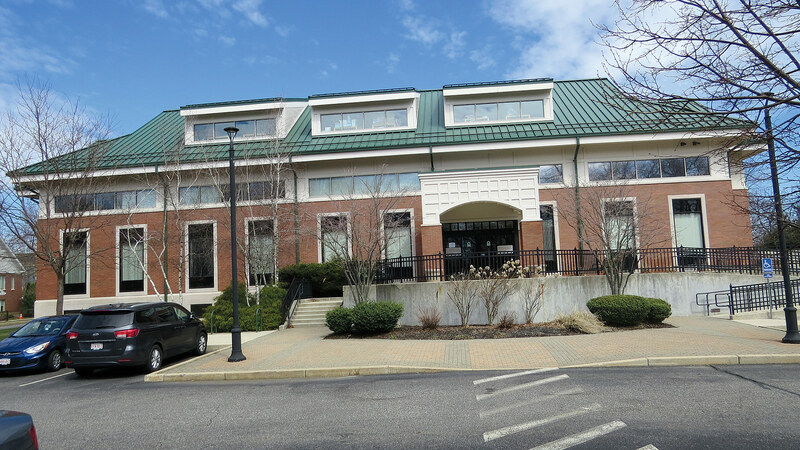 While the domestic-abuse shelter is perhaps the best-known of the programs and facilities operated by the YWCA to assist survivors, it is just one of many, said Dineen. The YWCA facility on Clough Street offers a number of services and programs — all of them designed to help survivors heal. There are other residential programs, including a transitional housing program in Springfield and teen-parenting residential programs in Springfield and Holyoke, she said, as well as a human-trafficking initiative undertaken in partnership with the Hampden County Sheriff’s Office, the U.S. Attorney’s Office, the Homeland Security Department, and other local, state, and federal agencies, and a host of community programs. These include the hotline, which Dineen called a critical service to the people of this region and even some who have moved outside it and call the hotline for tips on how to locate services in their new place of residence. Other services and programs include medical advocacy at hospitals for sexual-abuse victims, sexual-assault and domestic-violence counseling, SafePlan court advocacy, services for young parents, and many others. They are all designed to help people, like Anselmo, with what can be, and usually is, a complicated healing process. Complicated, because survivors often try to blame themselves for the abuse inflicted upon them, which is not conductive to recovery. “I can speak for all women when I say that we go through something traumatic … you’re lost, you’re scared, and you think ‘what did I do?’” she told BusinessWest. “That’s one of the questions that each and every one of us asks ourselves. We have to realize that it’s not us. 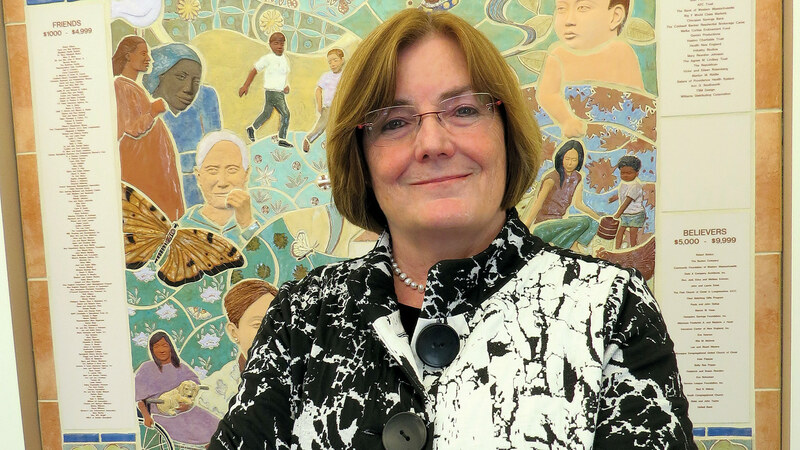 One program that is gaining traction — and results that may be difficult to quantify but certainly can be qualified — is the counseling service for children who witness violence, said Dineen, adding that it is designed for children ages 3 to 18 and provides tools to help those who have experienced violence firsthand, or witnessed it, to cope. They attend nine to 12 sessions, at which they are encouraged to identify their emotions and learn how to talk about what’s bothering them rather than resort to their fists or cruel words to vent frustration. “They talk about their feelings, and they talk about what makes a healthy relationship,” she noted, with the goal that such experiences won’t be repeated and won’t become generational, as so often happens. And, as noted, while she doesn’t have any statistical evidence with which to show progress, she has anecdotal evidence. “When I see kids come into our shelter and I meet and talk with them, I can see how aggressive some of them, and especially the boys, are,” she explained. “And I see how they talk to their siblings, especially their female siblings, and their mother. They can be very disrespectful and bossy; they’re repeating what they saw. As for the YouthBuild and GED workforce-development programs, they are helping young people like Alvarez get a second, or third or fourth, chance at not only finishing school, but developing self-esteem and perhaps finding a career. The program has existed for several years, said Dineen, but recently it was retooled (a new director was hired) and expanded to include not only a construction track, but one in healthcare as well, a path more attractive to most of the young women who participate. The program is starting to generate results, she said, and it is becoming a last/best option for students who have not enjoyed success in a traditional setting. And, like all the other initiatives at the YWCA, it’s focused on giving people the tools they need to succeed after they leave the agency’s programs behind them. With YouthBuild and each of the other programs, there are measures of success, some more obvious than others, said Dineen. “I measure success when my hotline is ringing off the hook — that shows people are using it,” she noted. “I measure success when people stay in our shelter, get the services they need, and then leave — and when they leave, they leave having a job, having safe housing, and having been through counseling so they can understand their own self-worth so they don’t need to get involved with a jerk. Alvarez and other participants in the YouthBuild program recently traveled to the State House. There, they met with members of the Western Mass. delegation and got some impromptu civics lessons. But this wasn’t just a learning experience. Indeed, while there, the students were also advocating for the YWCA and programs like YouthBuild, an assignment Alvarez undertook with considerable enthusiasm, telling legislators the same thing he told BusinessWest — that YWCA programs can provide light to someone who has been experiencing dark times and needs an opportunity to heal. It’s been doing this for 150 years now, and that’s truly worth celebrating. Mike Mathis, foreground, with recently promoted MGM employees, from left: Marissa Dombkowski, Bill Blake, and Nickolaos Panteleakis. 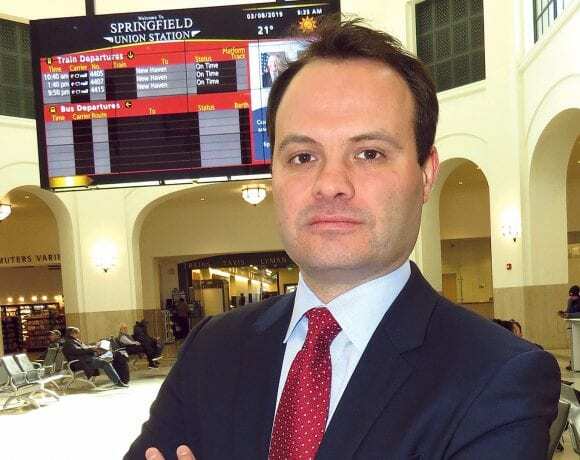 A half-year after opening its doors, MGM Springfield is well behind its stated goals and expectations for gross gaming revenues, or GGR, and the numbers have been declining each month since the fall. But the winter months are traditionally the slowest in this industry, said Mike Mathis, president and COO of the resort, and the company is still ramping up its operation. Overall, he said, there are a number of positive indicators. That’s the word you hear quite frequently from MGM’s leaders as they talk about the $950 million property in Springfield’s South End. 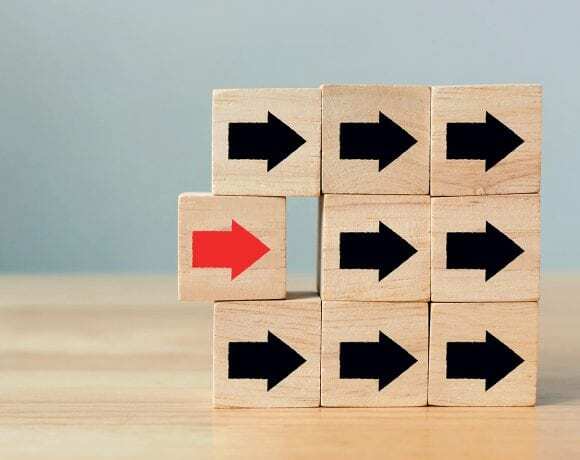 Jim Murren, president and CEO of MGM Resorts International, used it early and often in a conference call with stock analysts last month following the release of MGM’s fourth-quarter earnings in 2018. And Mike Mathis, president and COO of MGM Springfield, leaned on it as he talked with BusinessWest late last month, six months after the facility opened its doors. With casinos like this one, Mathis said, the ramping-up process, if you will, goes on for three years or so and is quite involved. It entails watching, listening, learning, and adapting, all with the goals of growing visitation and, therefore, the bottom line, while also improving efficiency and making the operation in question more profitable. 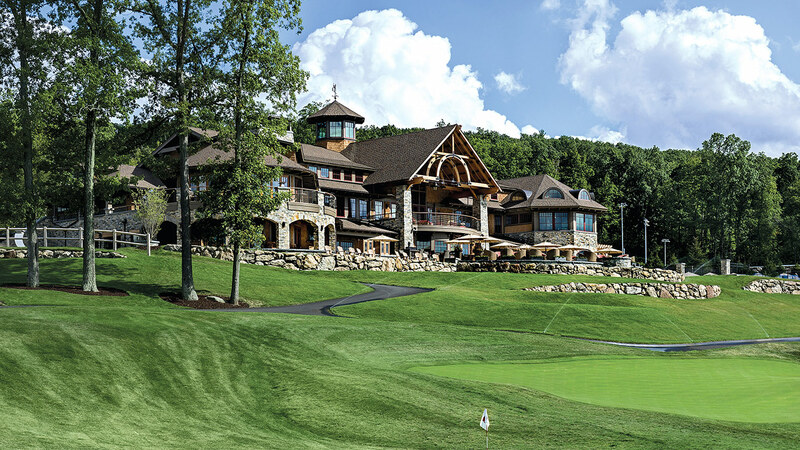 “In the context of a new resort, it’s commonly understood within the industry that there’s a three-year stabilization period — a ramp period to stabilization,” he explained. “Three years serves as a benchmark. You’ve been through a few different seasonality rotations, you see the different ranges of weather, you see the different ranges of how holidays land, whether they land on weekends or midweek — you get all those different scenarios. These references to ramping up are being generated by questions about revenues at MGM Springfield, and, more specifically, about why they are not approaching the numbers the company projected to the Mass. Gaming Commission. ‘Slower’ is the operative word being used with regard to revenues, and it fits if one considers MGM’s projections of $418 million in annual gross gaming revenue (GGR) in its first year of operation, or $34.8 million per month. Indeed, the company recorded $21.58 million in GGR in December, and just $19.7 million in January (February’s numbers will not be released for a few weeks). GGR for November was $21.2 million, the number was $22.2 for October, and in September, it was $26.95 million. 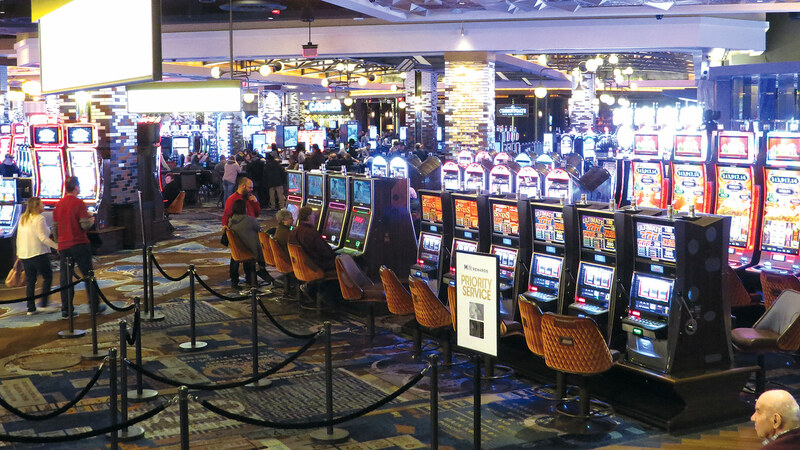 Mathis, while certainly acknowledging that the numbers are lower than projected, at least for the winter months, told BusinessWest that the $418 million projection given to the Gaming Commission was made several years ago, and that the landscape has changed in some ways since then. Mike Mathis says the winter months are traditionally the slowest for casinos in the Northeast, and he is optimistic that visitation will climb as the mercury does. Meanwhile … it’s early, said Mathis, referring to the fact that the casino has only been open for six months, and a few of those months (January, February, and early December, before the holidays) are among the slowest for casinos, especially those in the Northeast. And, overall, the casino is still ramping. That means it’s still learning, collecting data, watching patterns develop, and adapting to what the data shows. As he said earlier, it’s an involved process that involves a number of factors, including the weather. Make that especially the weather. Mathis said he and his team are tuned into the forecasts, because one thing he’s noticed thus far — and this counts as one of the surprises on his list — is that, despite a reputation for being hardy, people in New England are apparently easily scared off from traveling in snow — or even forecasts of same. “We thought New England would be hardier than what we’ve seen on some of these snow days,” he said with a laugh. “We’ve had a little bit of experience with snow in Detroit and Atlantic City, but I think every market is unique, and we’re learning some of the patterns and behaviors. One that extends, as he said, well beyond snow, and into other realms such as where people are visiting from, how often they visit, which games they play, which restaurants they frequent, and much more. Overall, and as might be expected, Mathis is optimistic that the monthly numbers for GGR will improve as the weather gets better and the casino can make much better use of its outdoor facilities with concerts — Aerosmith is coming for the first-anniversary celebration — and other activities. But looming over MGM Springfield, in a big way, is the opening of a competing casino in Everett, slated for sometime this summer. Mathis said that development will further alter the landscape and certainly add new wrinkles to the ramping process. 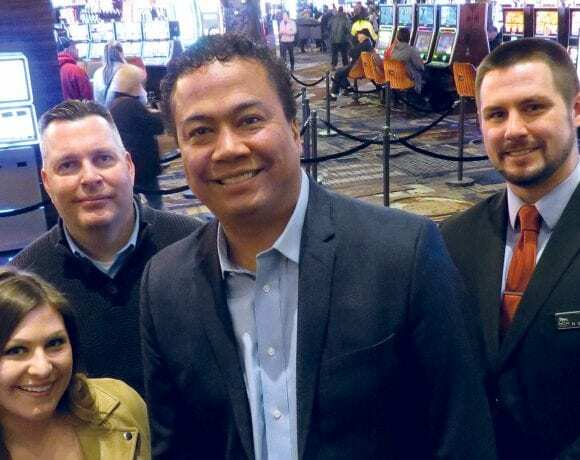 Mathis told BusinessWest that this first six months of operation have been a learning experience on all kinds of levels, and this, too, was to be expected, because gaming is still relatively new to Massachusetts (Plainridge Park Casino, a slots facility, opened in the fall of 2017), and while those at MGM had expectations, they didn’t know exactly what to expect. What have they learned? For starters, they’ve learned that visitors much prefer the weekend to the weekdays. And while that sounds obvious, the disparity in the numbers is eye-opening. “I’m surprised at how weekend-centric the business has been — the difference between weekends and weekdays is pretty dramatic,” Mathis noted, adding that, with the former, visitation averages roughly 18,000 to 20,000 a day, while with the latter, it’s closer to 10,000. This disparity is far greater than it is in Las Vegas and with most other MGM properties, said Mathis, adding that one big reason for this is a still-ramping (there’s that word again) meeting and convention business in Greater Springfield. Mike Mathis says the ROAR! 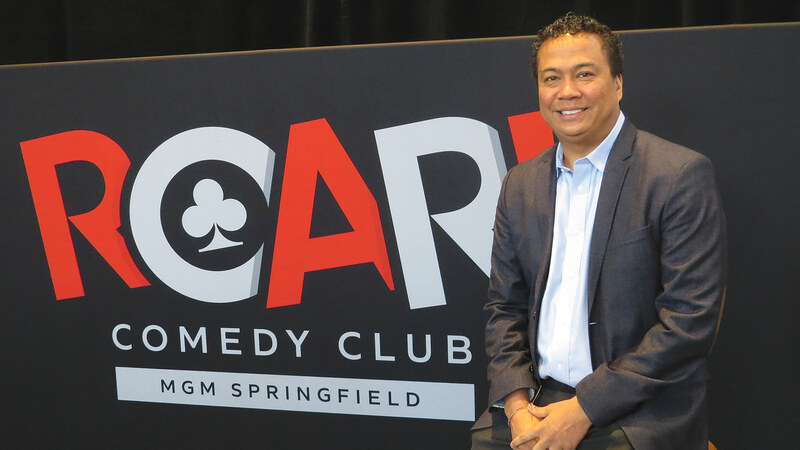 Comedy Club has become a solid attraction for MGM Springfield and a vehicle for bringing new audiences to the resort. What else have they learned? There’s that aversion to traveling in snow that was mentioned earlier. That was in evidence a few weeks back. The weekend before Presidents Day was one of the best the casino had since it opened, said Mathis, crediting MGM’s ROAR! comedy shows and a host of other things happening downtown and elsewhere, including two Thunderbirds games and a camping and RV show at the Big E, for the surge, one that contributed to one of the few real traffic jams recorded since the property opened. But the holiday itself (a day off for the vast majority of workers in this region) was considerably slower, and Mathis believes that the few inches of snow that fell overnight had a lot to do with this. Of course, Monday is also a weekday. What else? Well, to date, MGM Springfield is “underperforming” (Mathis’ word) when it comes to attracting people from Central Mass. Indeed, while the casino does well in drawing people from Upstate New York, New Hampshire, Vermont, and Connecticut (the I-91 corridor), the numbers from the central part of the state are less impressive, which, if you take the glass-is-half-full approach, which Mathis does, means there’s considerable room for growth. “We’re trying to understand the phenomenon of east-west travel on the Pike, frankly,” he explained. “I think there’s a bias to go north-south — I think that might be the more the traditional traffic pattern, and that’s what the data shows — but we’re also doing well with Boston. There have been a few other surprises, including the number of people making their first visit six months after the ceremonial ribbon was cut. 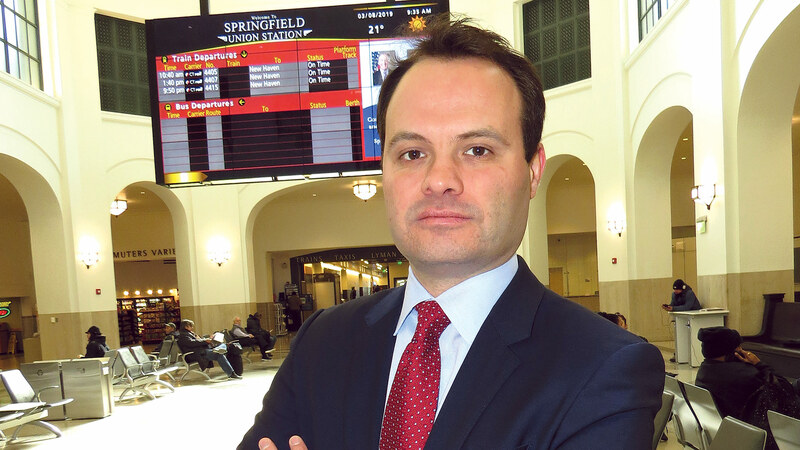 • The data clearly shows that the opening of MGM Springfield has grown the overall gambling market in this broad region, he said, adding that this becomes clear when one does some simple math and looks at MGM’s revenues and the declining numbers for competitors. The former is larger than the aggregate of the latter, which translates into growth, which bodes well for all players. • The ROAR! Comedy Club has been a solid addition to the MGM lineup, helping to drive visitation, especially during some of the slower months on the calendar. Located in the historic Armory, the shows have drawn consistent crowds, said Mathis, adding that, as the calendar turns to spring and then summer, the team at MGM Springfield will look to maximize its outdoor facilities with a full slate of entertainment to be announced in the coming weeks. 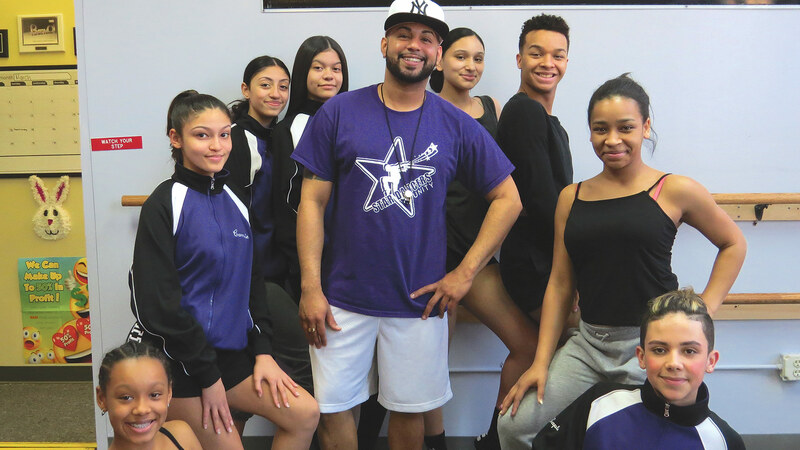 • The team continues to find new ways to leverage its many facilities at the casino, said Mathis, noting that it has added entertainment in its ballrooms — Sinbad recently performed two sold-out shows — and the staff continually looks for new opportunities. 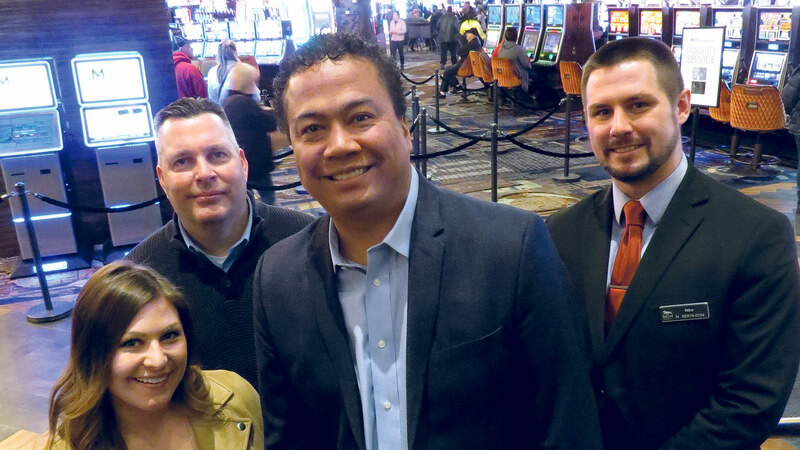 • The hotel and food and beverage side of the casino operation has been exceeding expectations, said Mathis, adding that, among other things, a recently added weekend brunch at Cal Mare restaurant has helped grow that side of the equation. • But despite this success, there has been some spillover to other area businesses in this sector, and this is by design, said Mathis, noting that the hotel, with 252 rooms, is not particularly large, and the dining options, while growing (groundbreaking on a Wahlburgers is slated for later this year), leave plenty of opportunities for other eateries in the downtown. • Likewise, the numbers regarding the workforce have been generally positive, said Mathis. He estimated a 35% churn rate since the facility opened its doors, and noted that, while this might sound high to business owners and managers in other sectors, it’s in line with industry norms and actually lower than in many other areas. Meanwhile, the targets for hiring Springfield residents, veterans, women, and minorities have all been met or exceeded, and many employees have already moved up the ladder since the casino opened its doors. As examples, he cited three employees who joined him for photos later in the day: Bill Blake, formerly graphic supervisor and now creative manager; Nickolaos Panteleakis, formerly Front Services manager (where he handled many front desk duties) and now director of Front Services; and Marissa Dombkowski, who has been promoted twice already — she started as an HR communications specialist, moved up to Entertainment Marketing coordinator, and is now Marketing manager for the MassMutual Center. Overall, and to recap, Mathis reiterated that ramping up is, indeed, a three-year process, one that involves a serious learning curve on many different levels. Mathis was one of those people caught in that traffic jam on the Saturday of Presidents Day weekend. He told BusinessWest that it took him more than 45 minutes to get to an event downtown from his home in Longmeadow, normally a 15-minute drive. But unlike most others, he certainly wasn’t complaining. “I’ve never been happer to be in stand-still traffic,” he said, adding that, while it has always been MGM’s goal to minimize such disruption, he’ll gladly take more nights like that in the weeks and months to come. And he predicts he’ll be getting more as that ramping process continues. 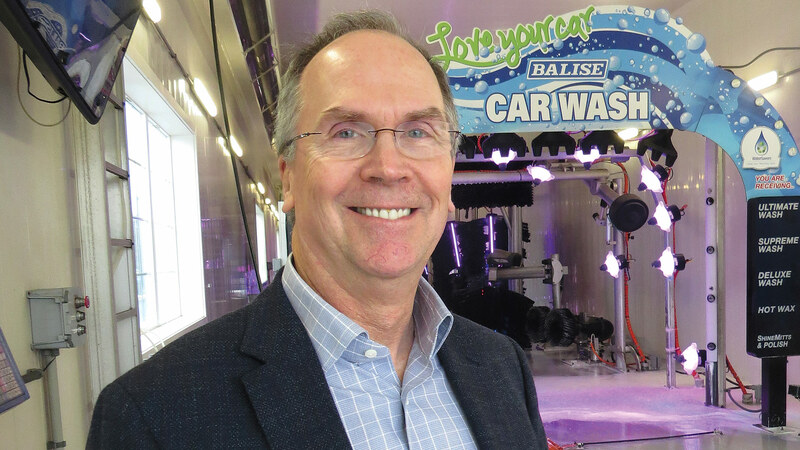 Jeb Balise stands in one of the company’s car washes, this one on Riverdale Street. 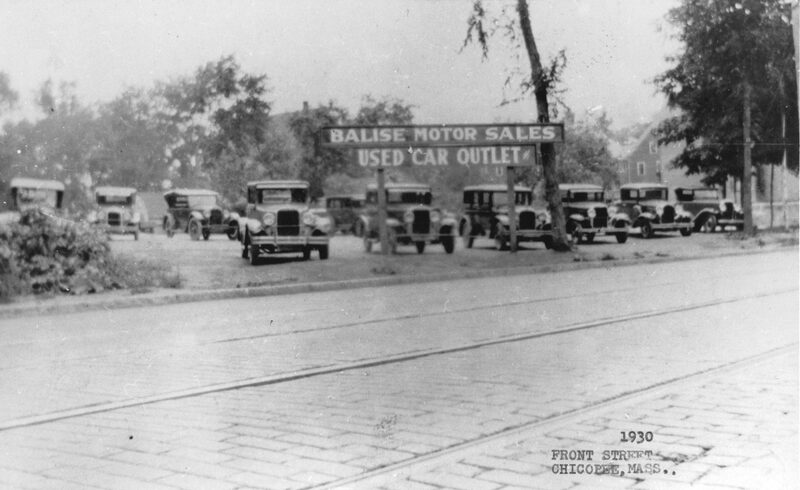 Some time in 1919 — when, exactly, no one really knows — Paul Balise went into business for himself repairing automobiles and selling them on the side. Today, that company he founded is one of the largest auto-dealer groups in New England and one of the 50 largest in the country. But in most all ways, it’s still doing business the same as it was when Woodrow Wilson was in the White House. As he flipped through the large photo albums he helped assemble, Bobby Balise moved slowly and methodically, stopping at each page, and sometimes each image, to offer a little commentary. That’s because every item in the collection helps tell a story that’s now 100 years in the making. There’s the picture of the small repair garage in Hatfield where it all began. There are photos of the family’s farm and some of the animals raised there. Moving ahead a few pages, there’s a sales receipt from 1936 for a three-year-old Chevrolet Town Sedan sold to a William Bolack, sticker price $410 ($50 was given for a 1929 Ford that was traded in). Little did he know the transaction would become a piece of family history. Honda models mingle with Chevys in the early 1970s. Flipping a few more times, Balise came to a grainy copy of a newspaper photograph, an aerial shot showing the Chevrolet dealership on Columbus Avenue, the York Street Jail across the road, and other buildings in Springfield’s South End — including dozens of homes that would be torn down years later to make way for I-91 — standing in more than three feet of water after the hurricane of 1938. 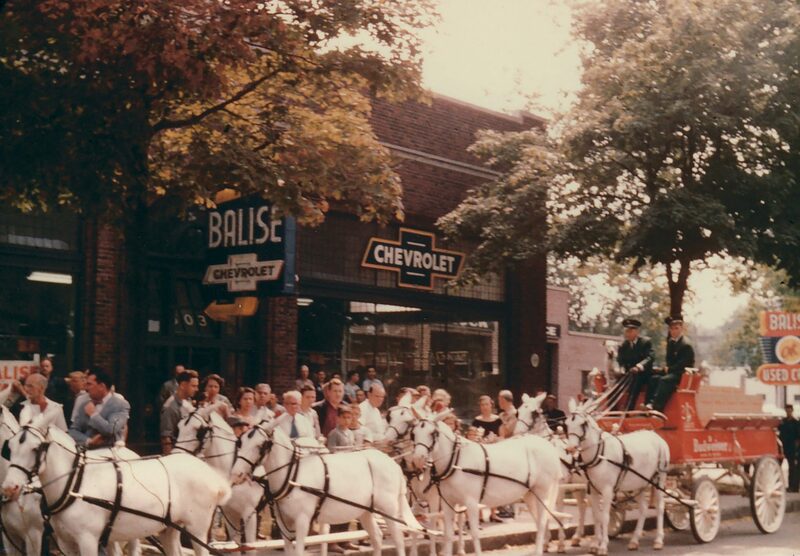 The Budweiser mules came to Springfield in 1954 and bedded down for a night at Balise Chevrolet, one of the more intriguing pages from the company’s long history. 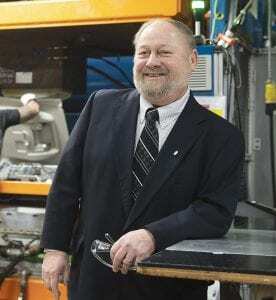 ‘Uncle Paul’ is Paul Balise, founder of the company now known as Balise Motor Sales. He grew up on a farm, as noted earlier, but gravitated toward repairing and selling farm equipment, and then, as they became more popular, automobiles, said Bobby, whose business card reads ‘parts inventory manager’ for Balise Honda, but whose unofficial title is company historian, a role he relishes, to put things mildly. 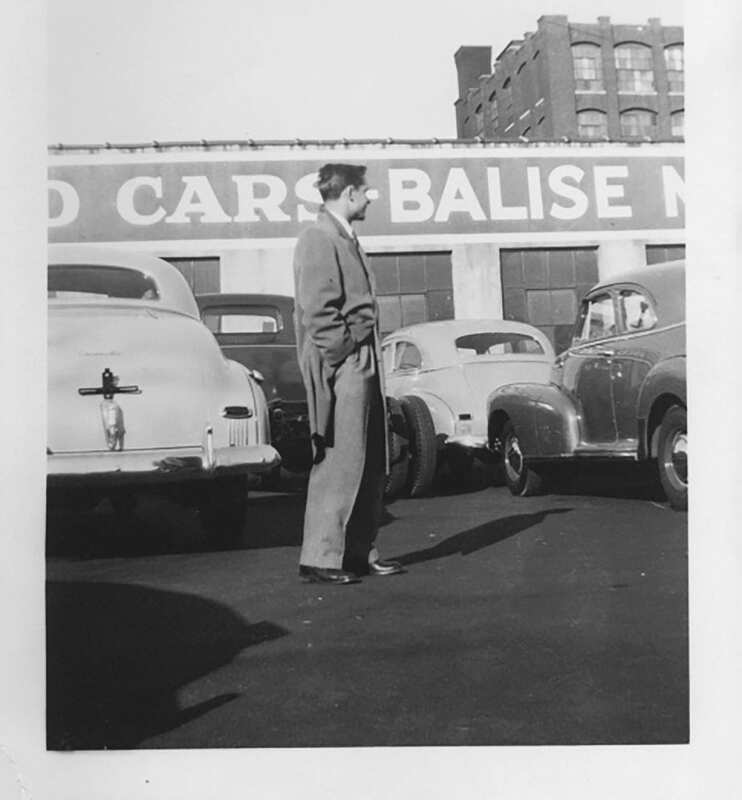 Paul Balise started with an auto-repair business called the Square Deal Garage and sold cars on the side, his nephew went on. Later, he established a used-car business on Front Street in Chicopee and would eventually become a Chevrolet franchise dealer. He moved to Main Street in Springfield before talking a big leap and leasing — and then buying — the lot on Columbus Avenue that Balise Hyundai still stands on today (much more on all this later). 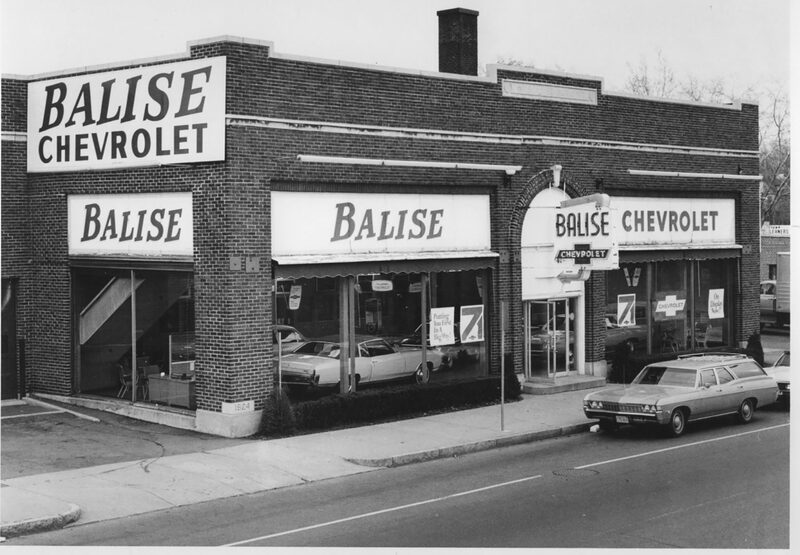 He was succeeded by his son, Jim, and then his grandson, Jeb, as president and dealer, and over the past few decades, Balise has grown to be the largest dealer group in this region, one of the largest in New England, and among the 50 largest in the country. Summing up the first 100 years quickly and succinctly, Jeb Balise said that, starting with the garage in Hatfield and continuing with his grandfather’s risky decision to buy the Williams Dodge property on Columbus Avenue, his father’s gambit to sell a little-known Japanese car called Honda at the Chevy dealership, and carrying on today with Balise car washes and a host of auto-related businesses, the company has seized opportunities when and where it could with an eye toward staying on the cutting edge of an always-changing business. 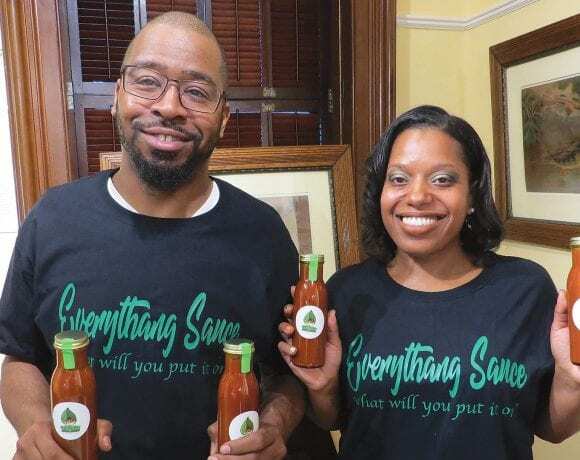 “Starting with my grandfather, we’ve been entrepreneurial and always looking for better ways to serve the customer,” he said, adding that it has been this way since 1919. When, exactly, in 1919 no one really knows, said Bobby Balise, adding that the company that has become one of the most recognizable brands in this region had a rather informal beginning. And there are some other dates and miscellaneous bits of information that remain question marks, such as the precise location of that dealership in Chicopee. But a great deal is known, he went on, adding that much of the company’s history has been chronicled in some form, and over the course of a year-long centennial celebration, the company will try to tell some of that history. While doing so, it will write some new chapters and add more images to the albums — figuratively if not literally, said Jeb, adding that, in this age of consolidation within the industry, the Balise company is only looking toward what it will take to be around another 100 years. Alex Balise McEwen, Jeb’s daughter and fourth-generation member of the Balise leadership team — she’s the marketing manager — told BusinessWest that the company is still piecing together plans for how and when it will mark the centennial. “This will be a year-long celebration,” she noted, adding that, in addition to bringing back the familiar ‘You’ll Do Better at Balise” slogan, radio commercials and other forms of marketing are noting that the company is commemorating 100 years of doing business in this region. 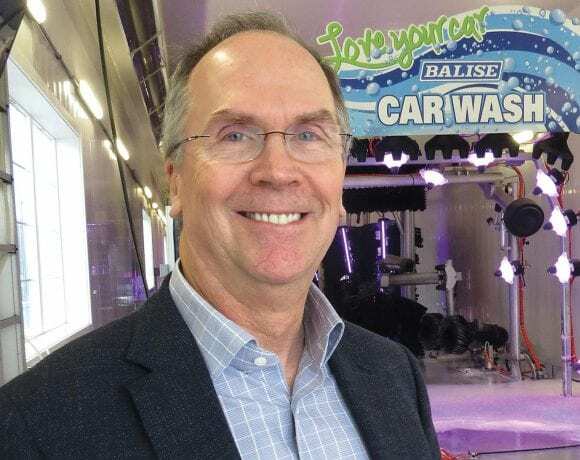 Alex Balise McEwen, fourth-generation member of the Balise leadership team, says the company will celebrate its centennial throughout the year and in many different ways. This business has certainly come a long way since the Square Deal Garage, and there have been many individuals and milestones of note, she went on, and the company will use various methods to tell those stories — such as the back wall of the area of the service department at Balise Honda where customers would pick up their vehicles after the work was done. There, several photos and types of imagery have been placed that help tell the story of this particular dealership. There’s a large photo of Milton Berman, founder of Yale Genton, the large clothing store that once stood on the property at the south end of Riverdale Street, as well as a photo of that store. But most of the others are related to the Honda brand and Jim Balise’s somewhat risky but ultimately rewarding decision to sell the small Japanese cars. Indeed, there’s a window sticker for a 1971 Honda model; the price was $1,775. There’s also a photo taken in 1972 in Forest Park showing Jim Balise and several of his colleagues standing behind a both a two-cylinder Honda and an eight-cylinder Chevy Impala. And then, there’s a large color photo of the 1973 Honda Civic, the car that changed the fortunes of not only that carmaker, but maybe the Balise company itself, said the company’s historian. 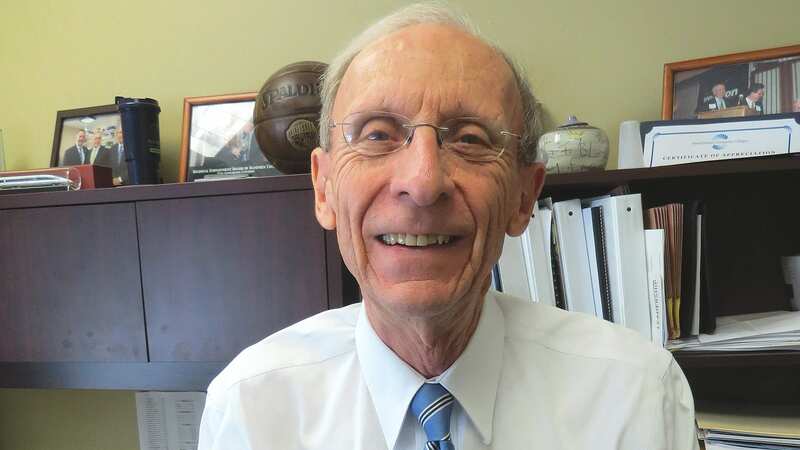 There have been many other fortuitous gambles and hard decisions made over the past 100 years, and by each generation, said Jeb Balise, who particularly likes telling stories about his grandfather, who he described as his best friend growing up. 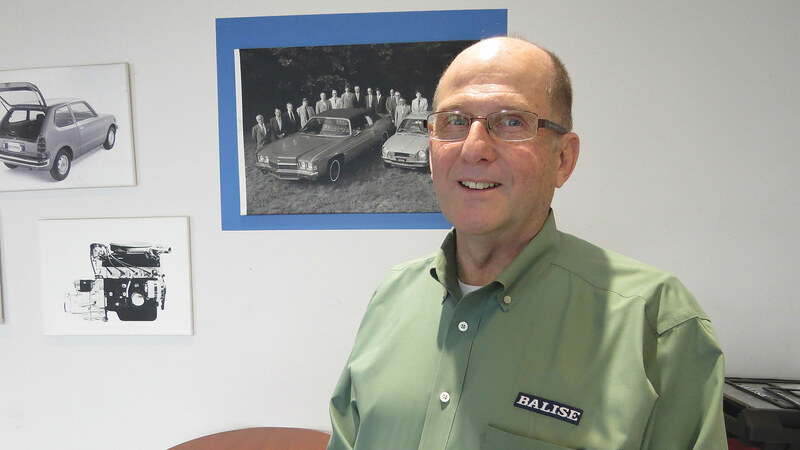 Recently made part of the inaugural class of the Massachusetts State Automobile Dealers Association’s New Car Dealer Hall of Fame, Paul Balise was a very hands-on manager who spent his career doing what he was doing at the start — fixing things, said Jeb, as one of his favorite stories about his grandfather reveals. Overall, what he did was set a tone, not just with his work ethic but with his ability to visualize opportunities and seize them. Slicing through the long history of the company, both Jeb and Bobby Balise said the decision to move off Main Street and eventually buy the Williams Dodge property on Columbus Avenue was a watershed moment and one that in many ways set the tone for all that was to follow. Bobby Balise is the Balise company’s unofficial historian, a role he’s carried out with great enthusiasm for almost a half-century. Jeb agreed, and siad the deal might not have happened if his grandfather was left to his own instincts. 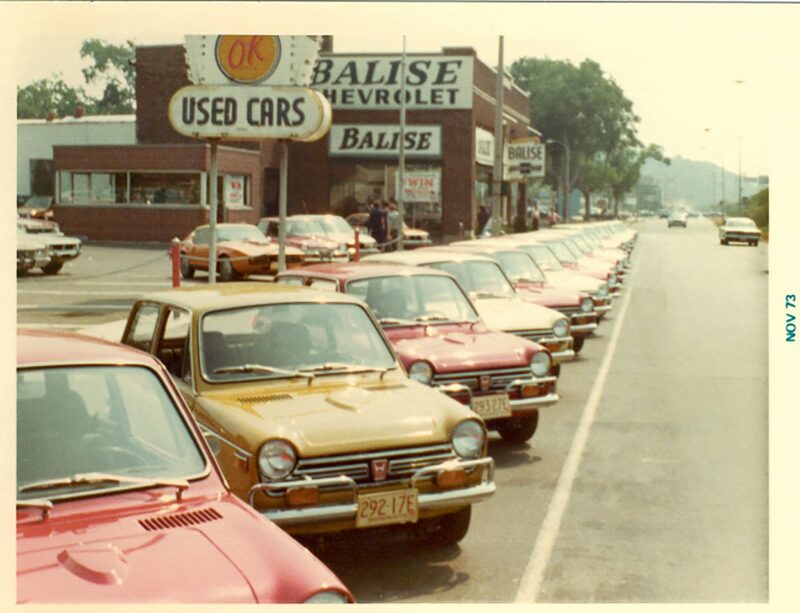 Moving quickly through the past 40 years of the company’s history — the part less chronicled in those albums — the Balise name moved well beyond Springfield and Chevrolet, starting with that Honda franchise. Today, the company has 21 new- and used-car dealerships in Western Mass., Rhode Island, and on Cape Cod, and a host of nameplates, foreign and domestic, including Chevy, Ford, Chrysler, Buick, GMC, Honda, Toyota, Nissan, Hyundai, Mazda, Kia, and many others. And, as noted, it has diversified with collision-repair shops and car washes. Diversification is necessary, he said, because Balise, with all the nameplates it sells, has more than adequate coverage in this region when it comes to sales. 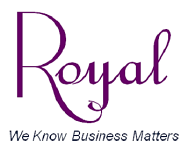 Opportunities for continued growth, therefore, lie more in other businesses related to the car. 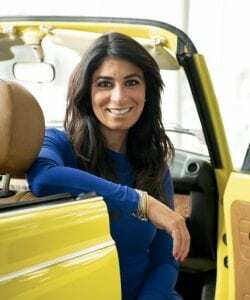 But there are opportunities to add dealerships in other markets, including Rhode Island and Connecticut, he said, adding that the company is always looking for new opportunities. 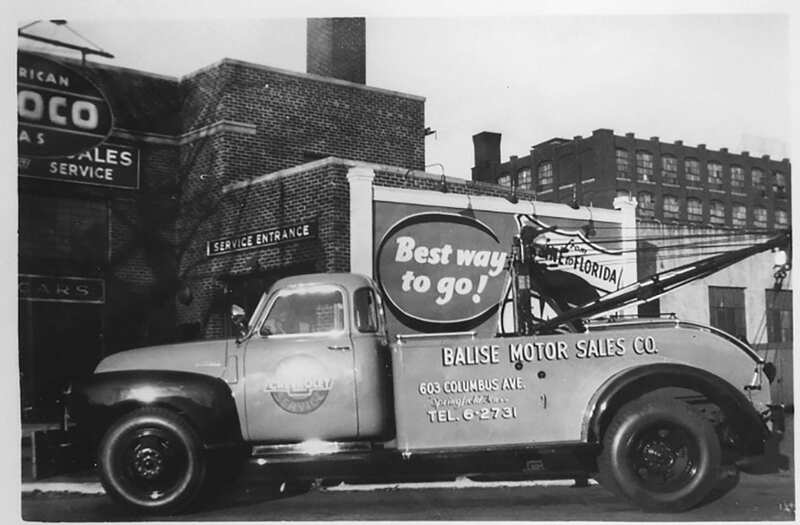 Paul Balise moved his Chevy dealership to Columbus Avenue at the height of the Great Depression, a risky move that set the tone for successive generations of company leadership. 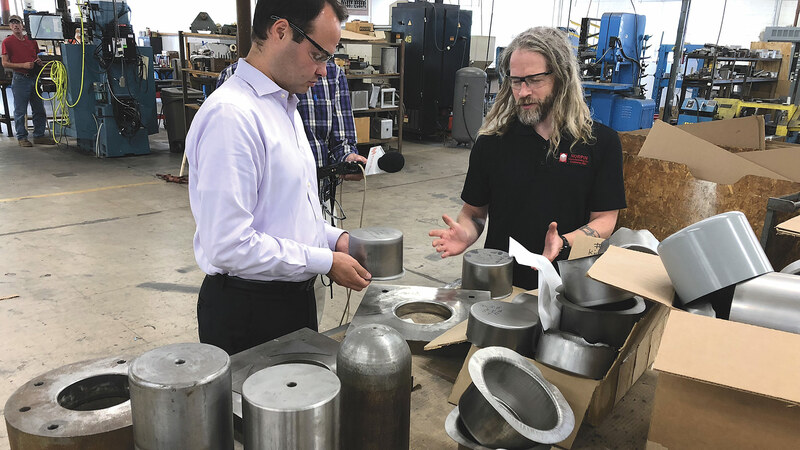 As he carries on the work of the generations that came before him, Jeb Balise said he learned a lot from both his father and grandfather — about the car business, yes, but more about business in general. Those thoughts stay with him today as he leads an auto group at a time of ongoing change and consolidation — a time when repair of vehicles is just as important a part of the business — and one with better margins — than new-car sales. In that respect, not much has changed in 100 years, he said with a laugh, adding that, in most all other ways, the landscape has changed considerably. Especially with regard to consolidation. Indeed, while the days of the single-franchise dealer are not officially over, they are certainly numbered. There’s still plenty of room for more consolidation, he went on, adding that single dealerships are being bought by groups, and groups are being bought up by bigger groups. Balise will not be one of the companies bought up by a larger group because it has no intention of being an acquisition target, said Jeb, adding that he rarely if ever even gets an inquiring call, because those who might pick up the phone know there’s no point in doing so. As he continued flipping through the photo albums, Bobby Balise stopped at a page with a curious but poignant collection of items. One is a photo of the company’s first tow truck, or wrecker, as they were called in those days — a 1948 Weaver with a three-ton boom and a hand crank. It’s symbolic of how the company has always been about more than merely selling cars. And then, there’s a recounting of what was said to Paul Balise by friend Bob Johnston as the two were playing a round with others on the recently opened Franconia Golf Club in Springfield and Paul was expressing considerable anxiety over his decision to buy the vacant auto dealership on Columbus Avenue. “The clouds you so much dread are rich in mercies and shall break in blessings on your head,” Johnston supposedly said. That’s a prescient thought and a harbinger for a company that has seen the sun shine on it over the years, but also has been able to make it rain — in all kinds of ways. 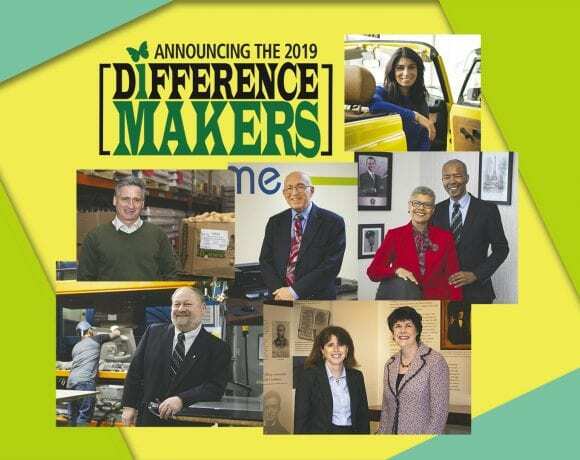 It was almost a decade ago now when Bill Ward, then the executive director of the Regional Employment Board of Hampden County, stepped to the podium at the Log Cabin Banquet & Meeting House in Holyoke to accept the first Difference Maker award presented by BusinessWest. Much has happened since then. Ward retired a few years later, and the REB is now known as the MassHire Hampden County Workforce Board. But the Difference Maker award remains a constant — and a symbol of excellence and dedication to improving quality of life in this region. Since the very beginning, this recognition program has shown conclusively that are a great many ways to make a difference. And the class of 2019, the program’s 11th, makes this even more abundantly clear, as the stories clearly show. The six members of the class of 2019 will be honored on Thursday, March 28 at the Log Cabin. For information about the event, sponsorship opportunities, or to purchase tickets, call (413) 781-8600, ext. 100, or go HERE. The Isenberg Innovation Hub, a $62 million expansion and renovation of the business school’s facilities on the UMass Amherst campus, will open its doors to students later this month. The building’s exterior design is stunning, and it gives a new face to Isenberg and perhaps the university, but the architects have made it functional as well. Dramatic. Striking. Stunning. Powerful. Distinctive. 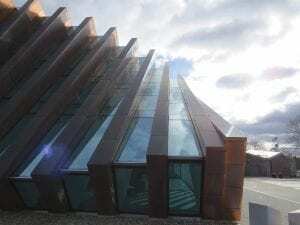 Those are some of the words that come to mind as one takes in the Isenberg Business Innovation Hub, a $62 million, 70,000-square-foot addition and renovation to the Isenberg School of Management at UMass Amherst, and its copper cladding, circular design, and falling-dominoes effect. And those who conceptualized this project and then went about raising the money for it certainly had all those adjectives in mind when they went about hiring architects to create something that would effectively, and loudly, announce the Isenberg school’s ascension to the ranks of the best business schools in the country — and also help recruit the next generation of top students. But that’s certainly not all they wanted — or demanded. “Now that we are a top-20 business school, the students who are considering us are also considering a lot of other exceptional business schools,” said Tom Moliterno, interim dean at Isenberg. “And one of the things that a student and his or her parents think about is the physical space; there is a requirement, much like a football team needs good facilities, for facilities of a certain caliber in order to ensure that we get the best students. 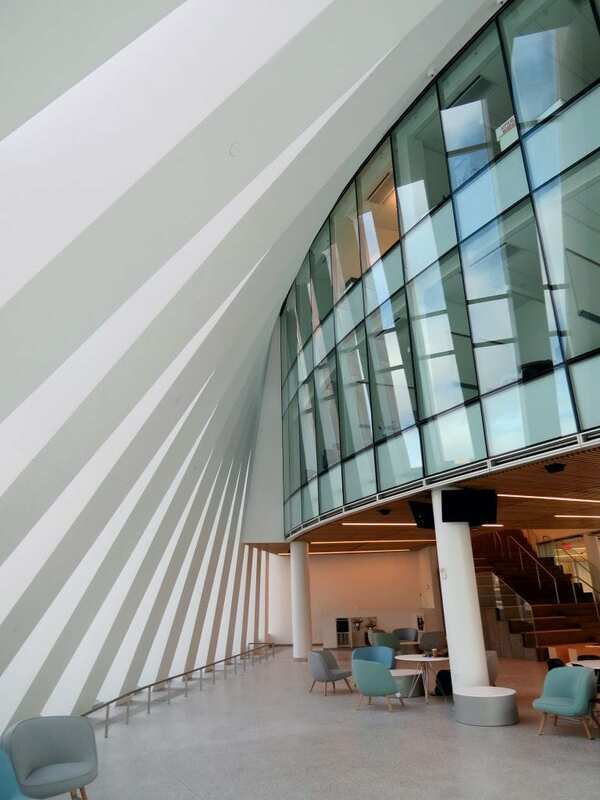 The learning commons in the Isenberg Business Innovation Hub, like the building itself, has both a striking design and a great deal of functionality; it also doubles as event space. Elaborating, he said business schools today require space that is geared far more toward student collaboration, team working environments, distance learning, and career services than even a decade or two ago. And all of this is reflected in what’s behind the flashy exterior of the Business Innovation Hub. Indeed, as he conducted his formal tour of the new facility, Moliterno seemed to be constantly pointing out places where people, and especially students, could come together and collaborate. The hallways, like all the areas in the Business Innovation Hub, are designed to promote collaboration. In the learning commons, which doubles as event space, there are dozens of soft chairs and small round tables at which people can gather; in the classrooms, the chairs have wheels, and for a reason — so they can be moved and maneuvered to face in any direction, toward the instructor in the front of the room or the student across the table; in the hallway outside the classrooms, there are more soft chairs and gathering spaces; in the courtyard, there are stone benches; on the grand stairway, there are wooden planks affixed to one set of the concrete stairs — again, for a reason. “If you’re heading up the stairs and you see someone coming down that you want to talk to, you can pull over, sit down on the stairs, and talk,” said Moliterno, adding that the architects — Boston-based Goody Clancy, in partnership with the Bjarke Ingels Group (BIG) of New York and Denmark — went to extremely great lengths to inspire and facilitate collaboration, and this, perhaps even more than the stunning exterior and interior designs, is what the new addition is all about. 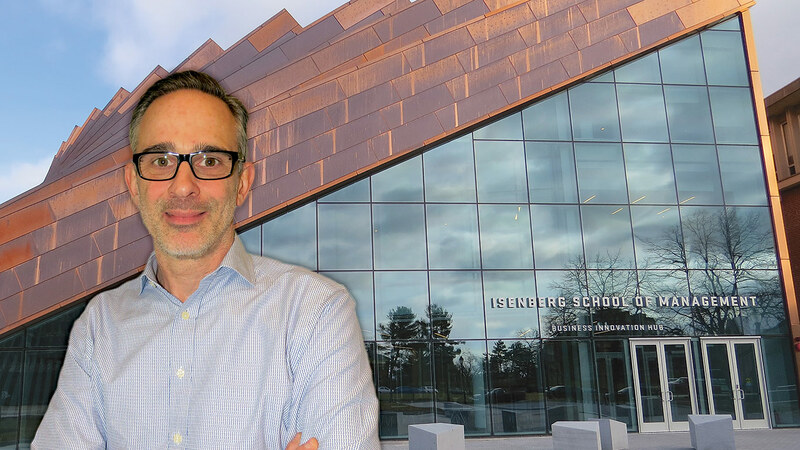 Roger Goldstein, the principal at Goody Clancy who headed the Isenberg project, agreed, and said the firm applied lessons from two decades of work designing college business schools and additions to the Isenberg initiative. 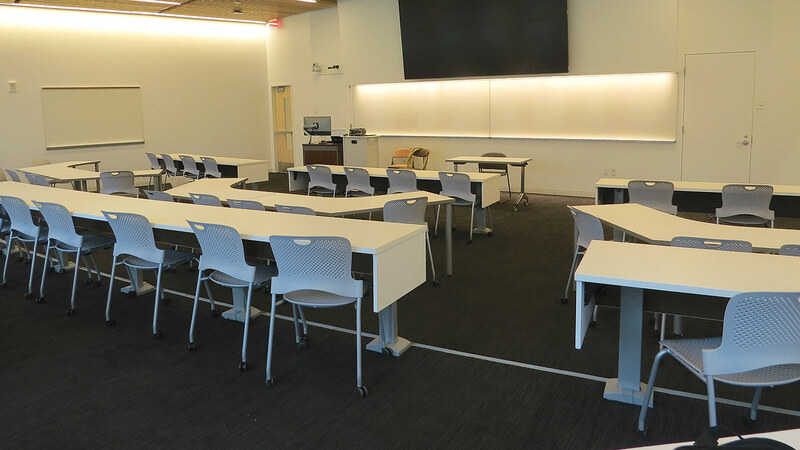 Faculty and staff are currently moving into the new facilities, said Moliterno, adding that the building will be ready when students return to classes later this month. One of the state-of-the-art classrooms in the Business Innovation Hub. What they’ll find is a state-of-the-art, user-friendly facility that does a lot for Isenberg, and UMass Amherst on the whole. It gives the business school — and perhaps the university itself — a bold new face. It also gives the school a powerful new recruiting tool and perhaps the ability to rise still higher in the rankings, something that’s difficult to do as it moves up the ladder. 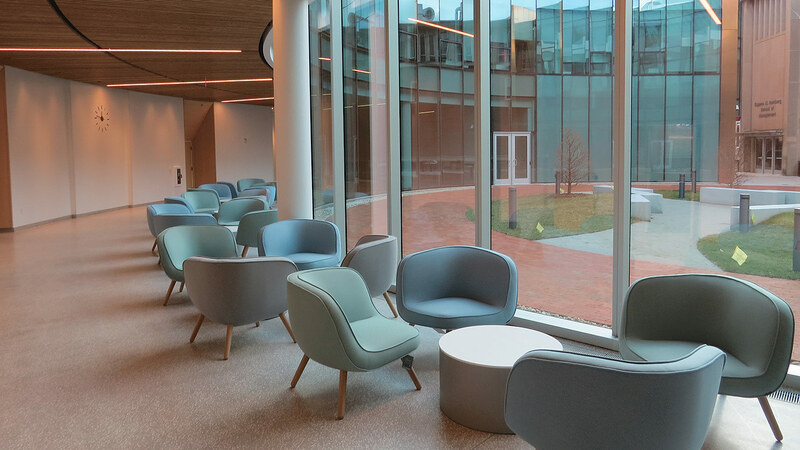 For this issue and its focus on education, BusinessWest toured the Business Innovation Hub and learned how it blends form and function and punctuates the Isenberg School’s ongoing ascent among the nation’s top business schools. While obviously proud of the expansion’s ground floor, with its learning commons, courtyard, hallways crowded with gathering spaces, and generous amounts of glass, Moliterno was anxious for his tour to reach the second floor. Because this is where more of that all-important functionality can be found. And it manifests itself in a number of ways, from greatly expanded and enhanced space for the Chase Career Center to separate lounges for students waiting to be interviewed and recruiters waiting to do some interviewing, to the small interviewing rooms that, when not being used for that purpose, can double as additional gathering spaces for students, thus maximizing each available square foot of space. Before elaborating on this mindset and what the Business Innovation Hub means for Isenberg, its students, faculty, the recruiters who will visit it to query job candidates, and other constituencies, Moliterno first went back to roughly the start of this decade, when the seeds for this facility were planted. And they were planted out of need, he went on, which came in many forms. The first was simply spacial. Indeed, while the original Isenberg building, built in 1964, was expanded with the so-called Alfond addition in 2002, by the start of this decade, and actually long before that, a growing Isenberg was busting at the seams. “What we used to say is that we were a family of eight living in a two-bedroom apartment,” said Moliterno, noting that undergraduate enrollment at Isenberg had risen from 2,500 in to 3,400 in just a few years earlier this decade. Facilities were so cramped that some departments within Isenberg, such as Hospitality & Tourism Management and the Mark H. McCormack Department of Sport Management, were spread out in other buildings, said Goldstein, creating an inconvenience for students and faculty alike. The Business and Innovation Hub brings all of Isenberg’s departments and offices together under one roof. Beyond the need for more space, though, Isenberg also needed better space, said Moliterno — space that reflected its climb in the rankings in the U.S. News & World Report listings of business schools — both public institutions (it’s now 26th nationwide and first among undergraduate programs in the Northeast) and overall (44th in the nation). And space that would help Isenberg compete for students applying to the other schools just above or below them on those lists. “Relatively early in his tenure, Mark Fuller realized that the school was on a trajectory, both in terms of growth and in terms of quality, that was going to necessitate new physical space,” said Moliterno, adding that the first discussions and estimates on square footage required date back to 2010 or even 2009. At this point, the project essentially “went into the queue,” as Moliterno called it, noting that there were a number of building projects being forwarded for consideration and funding. To move up in the queue — something deemed necessary as the school continued its torrid pace of growth as well as its ascent in the rankings — the Isenberg School took the unusual step of committing to provide 60% of the funding for the project, with the rest covered by the university. This commitment translated into the largest ever made by a specific school for a campus building project, he went on, adding that this bold step did, indeed, move the initiative up in the queue. And in 2014, formal planning — including specific space requirements and preliminary cost estimates — began in earnest. However, in the two to three years since the initial discussions and rough sketching were undertaken, construction costs had increased 50%, he said, bringing the total cost to $62 million. While raising that sum was a challenge — met by tapping into a growing base of successful Isenberg alums — it would be only one of many to overcome. Another would be fitting the building into that crowded area of the campus while also negotiating a veritable rat’s nest of underground utilities in that quadrant. Creating a road map for navigating this bowl of spaghetti was just one component of the assignment eventually awarded to Goody Clancy and the Bjarke Ingels Group — a partnership that Moliterno called a ‘perfect marriage’ of an emerging force in the design world (BIG) and a company with vast experience in designing not only academic buildings, but business-school facilities. Indeed, BIG has been on a meteoric rise, with a portfolio now boasting Two World Trade Center in New York, Google’s Mountain View, Calif. headquarters building, and several dozen other projects either under construction or in the planning stages. As for Goody Clancy, as noted, it has spent the past 20 years or so developing a strong niche designing new buildings and additions for business schools, and the portfolio includes recent work at Harvard, Boston University, Georgetown University, Texas Tech, and the University of New Hampshire. Development of this niche wasn’t exactly by design, to use an industry term, said Goldstein, but as often happens in this business, a single project or two can lead to additional opportunities. And that’s what happened after the firm took on a project for Babson University, known for its programs in entrepreneurship. “We then did a few more, and before you knew it, we had three business-school buildings, and we thought, ‘OK, this looks like a specialty,’” he told BusinessWest, adding that the company has another four or five business-school projects in various stages of completion, a reflection of the need for such institutions to keep up with the Joneses, if you will, so they can effectively compete for the best students. Inamoto agreed. “Schools definitely want to make a statement with these buildings,” he said, adding that the Isenberg addition is the first academic project taken on by the firm in this country, and thus it sought to partner with a firm with a deep portfolio in that realm. As they went about designing the addition, the team of architects focused on both of their priorities — form and function. They conceptualized an exterior that would fit in — sort of — and respect the brutalist style so prominent in other buildings in that part of the campus, such as the Fine Arts Center and the Whitmore Administration Building. 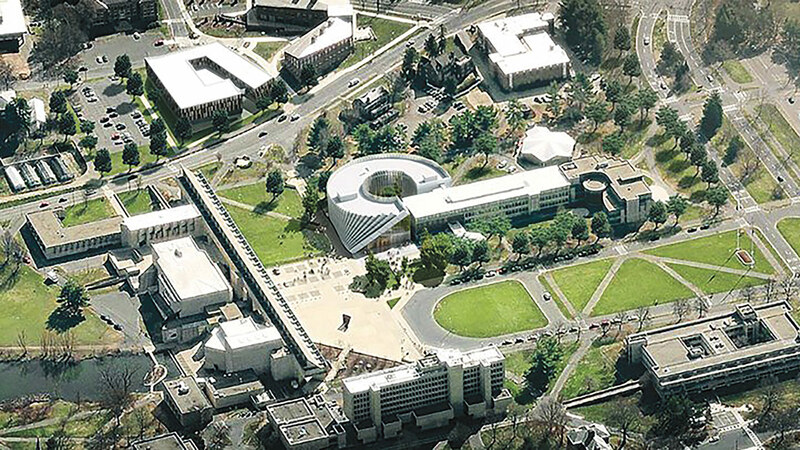 The circular design, meanwhile, would create a dynamic look that would also connect, in dramatic fashion, with the existing Isenberg facility (as the aerial architect’s rendering on page 18 shows) and “close the loop,” as Goldstein put it. 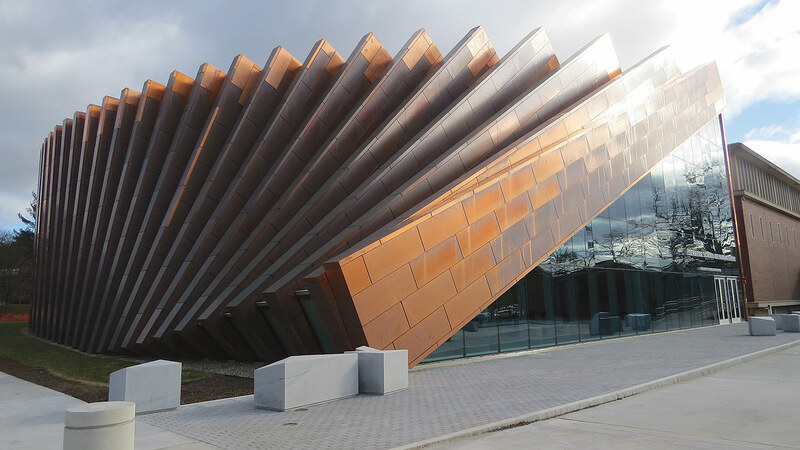 As for the copper exterior, Inamoto said it was chosen — after aluminum was first considered — because the material, like the school itself, isn’t stagnant; it changes over time. “As a firm, we like the look of copper, and we like to recommend naturally aging materials,” he explained. “The copper panels are already starting to weather; when they’re first installed, they’re a bright, shiny orange, and within weeks, that starts to become darker and brown, and over time, they’ll oxidize to a green copper look. 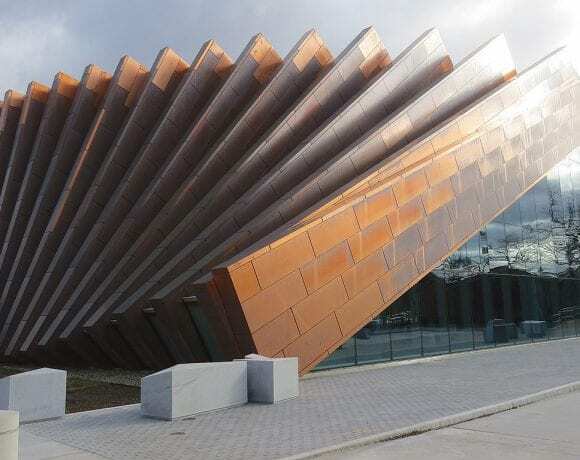 In designing what’s behind the copper façade, they started by gathering extensive feedback, via focus groups, from a number of constituencies, including Isenberg administrators and staff, students, faculty, and others. And they incorporated what they learned into the final design, said Moliterno, citing everything from a café to greatly expanded space for the career center and undergraduate advising. “They brought in Career Services and said, ‘walk us through everything you do — what are your space needs? You have interviewers here — how many, and what do they need?’” he recalled. “And then, they had that same conversation with Undergraduate Programs and with a committee of faculty who talked about the classroom space. As for the career center and undergraduate advising facilities, these are as important to the ultimate success of Isenberg students (and the school itself) as the classrooms, said Moliterno, adding that these facilities provide more services to far more students than they did even a few years ago. As he walked through the expanded career services office during his tour, Moliterno put the Business Innovation Hub and the chosen designs for it in their proper perspective. “At the initial bid process, when I was speaking to all the architects who were bidding, I said, ‘I want to be clear about something: this might be the most beautiful building in the world, but if it doesn’t work for the students, if it doesn’t enhance and improve the student experience, it will be a failure — full stop,’” he recalled. ‘Most beautiful building in the world’ is a purely subjective matter for discussion, he went on, while the matter of whether a building works for students certainly isn’t. He’s quite sure that this one does, and while that quality generally doesn’t warrant adjectives like ‘dramatic, ‘striking,’ ‘stunning,’ or ‘powerful,’ it probably should. And it explains, even more than that façade, why the Isenberg Business Innovation Hub is such an important development for the school and the university. In the early 1950s, Guy ‘Sonny’ Antonacci started a sanitation business with a single truck. That venture has evolved into a diversified, multi-generational family business that includes a horse-racing farm, a family-entertainment facility known as Sonny’s Place, and a country club in Hampden known as GreatHorse. Each component of this conglomerate was the product of vision, entrepreneurial spirit, hard work (lots of that), and some luck. For their ability to breed winners — at the track and in business — the Antonacci family has been named BusinessWest’s Top Entrepreneurs for 2018. 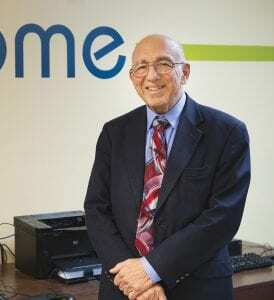 Frank M. Antonacci was asked to talk about his grandfather, the late Guy ‘Sonny’ Antonacci, and put his life and entrepreneurial spirit into some kind of perspective. It was a straightforward request, but Frank M. (the M is to distinguish him from his father, Frank A. — “I’m not a junior, and he’s not a senior”) paused and then struggled somewhat as he searched for the words and phrases to get the job done. Frank’s cousin, Guy, named after his grandfather, obviously, agreed, and also put the word ‘visionary’ to heavy use. It was Sonny who started a trash business in New York, back roughly 65 years ago, with a single truck named the ‘Mary Anne,’ after his wife. With that one truck — more or less — he and subsequent generations would go on to build a number of successful, high-profile businesses, including the enterprise that sprang from the Mary Anne, USA Waste & Recycling, one of the largest companies of its kind in the region. There’s also a horse farm, Lindy Farms in Somers, that has bred and trained a string of champion trotters; Sonny’s Place in Somers, named, obviously, after the patriarch, a huge and continually growing family-entertainment venue that now includes everything from miniature golf to ziplining to a century-old carousel (more on it later); and, last but not least, GreatHorse, the high-end private golf club created on the site of the old Hampden Country Club but looking nothing much like its predecessor; in a nod to Lindy Farms, there are horse references throughout, right down to the banquet hall, named the Starting Gate. 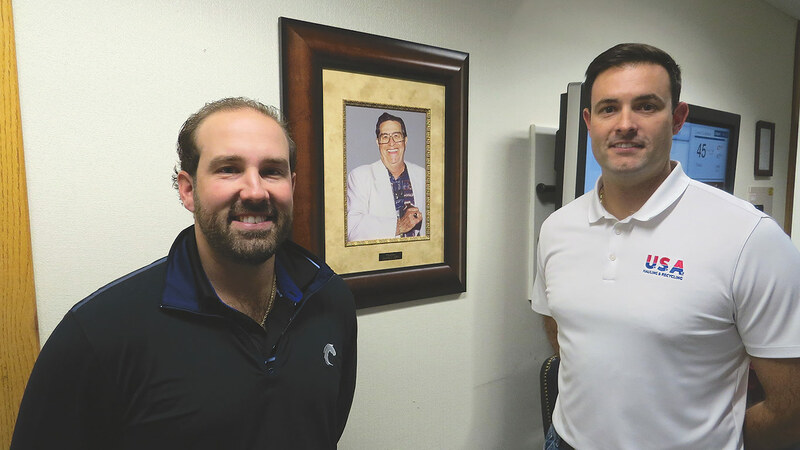 Guy, left, and Frank Antonacci stand by a photo of their grandfather, ‘Sonny,’ in the lobby of USA Waste & Recycling. As we examine this stable of successful businesses (yes, that’s the first of many horse and racing terms you’ll read), we’ll start by going in the wayback machine to July 1969 and, more specifically, a Sports Illustrated article (printed in an issue with Vince Lombardi on the cover) chronicling the meteoric rise of a horse called Lindy’s Pride, bought for $15,000 by Sonny Antonacci and several cousins. All of whom, the SI writer recalled, grew up working on ice trucks before they worked on garbage trucks, and struggled for many years to build the business. Maybe. But in many respects, this family has made its own luck, and continues to do so today. Indeed while it’s easy to say that all of this — and ‘all’ means the horses, the go-karts at Sonny’s Place, and the country club — was born of New York trash. But in reality, it was all born of an entrepreneurial spirit and an ability to see something that wasn’t there before. Indeed, Sonny’s Place was formerly a ramshackle driving range, said Guy Antonacci. “There were days when we’d see maybe a few people come in; it was like that driving range in Tin Cup, with a pink 1960 Volkswagen Beetle out front,” he recalled, making a reference to the popular movie starring Kevin Costner, who played a down-on-his-luck golf pro and operator of a range frequented by more armadillos than duffers. 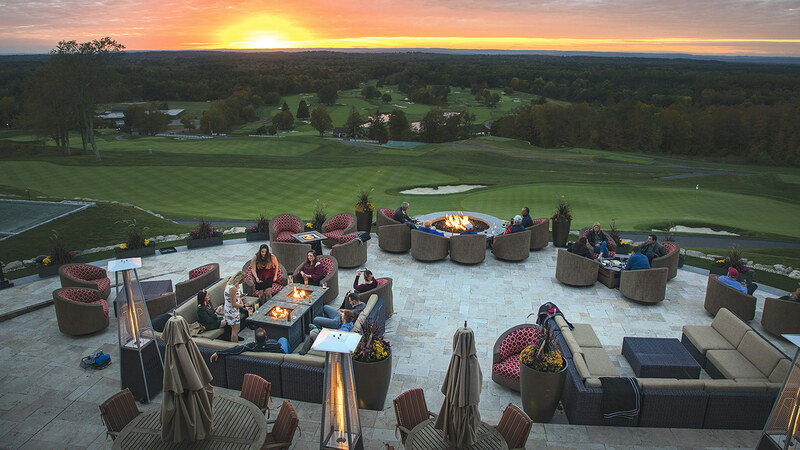 And Hampden Country Club was essentially dying on the vine when the family bought it a decade ago and decided, eventually, after an initial attempt at a mere makeover, to transform it into the most luxurious, and exclusive, club in the region. For their efforts over the past seven decades or so, the Antonacci family — and yes, that includes Sonny, his brothers, and cousins — have been chosen as BusinessWest’s Top Entrepreneurs for 2018. This amounts to a lifetime achievement award for the family — actually, several lifetimes. Because today, as decades ago, members of this family stay humble and understand the meaning of a buck — and how to make one as well. This becomes clear in an extensive interview with Guy and Frank M., chosen spokespeople for a family that knows what it’s like to breed winners — as in horses and business ventures. There was a light snow falling on Christmas Eve morning, and it lent even more beauty to a place where it abounds — Lindy Farms. There, Frank M. talked about the business and especially the large, handsome horse called Lindy the Great. A trotter, he enjoyed a successful 2018, winning several races, and on this morning was getting a brushing and some R&R before heading to Florida for the off season. Lindy the Great, 16.1 hands high (not 16.2 or 16.3), by Frank’s guess, is the embodiment — one of many, actually — of the multi-faceted businesses ventures that did, indeed, spring from New York trash. Our story begins with that trash truck called the Mary Anne and the venture that became known as the South Shore Sanitation. While remaining a relatively small operation, it provided the wherewithal to venture into horses — and much more. In 1974, Sonny, following a priest who had been reassigned to a church in Somers, moved his family there, said Frank, adding that, while he was ‘retired’ at age 40, he didn’t stay retired for long at all. He and Mary Anne started Somers Sanitation, again, with one truck (this one didn’t have a name), and quickly grew the enterprise, which now stretches from the Vermont border to Southern Connecticut. What was originally envisioned as a ‘makeover’ became the total transformation known as GreatHorse. Today, it boasts five hubs and 16 transfer stations, serving a wide range of businesses and communities in Connecticut and Western Mass. It was with profits from the trash business that Sonny Antonacci and several cousins ventured into horse racing. Their passion for the sport began when they attended races at Roosevelt Raceway on Long Island, and it went to a much higher and different level when they bought their first horse, named Galahad Hanover, and shortly renamed Lindy’s Pride, in 1967. That horse would go on to win not only the Hambletonian, but the illustrious trotting Triple Crown, and essentially set a tone for Lindy Farms, named, sort of, after the town of Lindenhurst on Long Island, where the Antonaccis grew up. Over the years, the operation, now in Somers, Enfield, and Hampden, Mass., has continued its winning ways and expanded on several fronts. Especially with a stallion called No Nay Never. “He might be the hottest freshman stallion in the world this year,” he said, noting that, as a 2-year-old, he won honors as ‘Thoroughbred of the Year’ in Europe. The racing business, like the trash business before it, typifies how this family approaches business — by going all in. They don’t just want to be a player in an industry; they want to dominate that industry. Indeed, horse breeding and racing has become a passion for three generations of family members, and the level of excellence attained becomes apparent in the number of trophies and awards on display at the offices of USA Waste & Recycling. 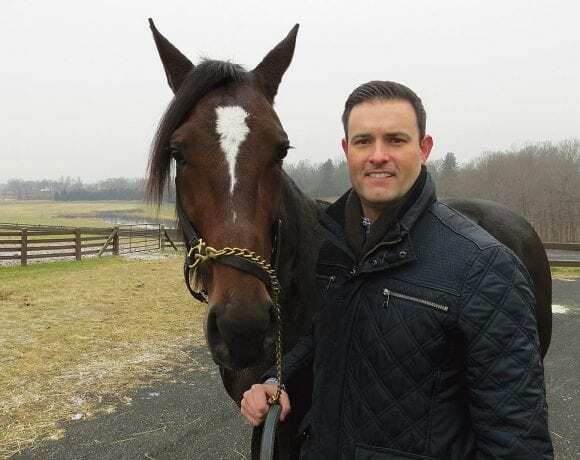 Sonny Antonacci is considered a visionary when it comes to breeding standardbred racehorses, said his grandson, Frank, and he bred more Hambletonian horses than any individual breeder. In 2001, Sonny, along with his cousin Frank, were elected to the Harness Racing Hall of Fame’s Hall of Immortals. That racing tradition continued with the next generation, his sons, Jerry and Frank, who have remained active in promoting the industry. 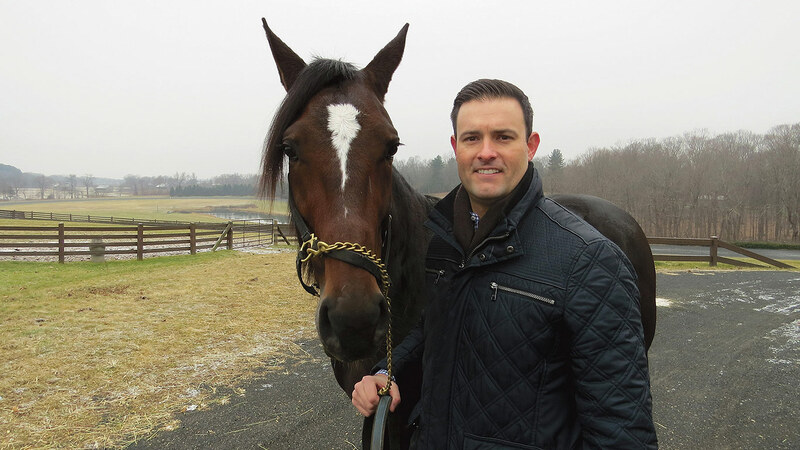 Frank is currently director of the Hambletonian Society, which oversees the development, administration, and promotion of the harness-racing industry throughout the country, and he’s also director of the U.S. Trotting Assoc., the governing body of the entire domestic industry. And Frank M. (known as Frankie to family members) has taken up that mantle. He’s now the head trainer at Lindy Racing Stable and has been making a name for himself within the sport, winning the U.S. Trotting Assoc. ‘Breakthrough Award’ in 2010. While there are no trophies, ribbons, plaques, or prize winnings to quantify success in their other business ventures, the Antonaccis’ drive to take the lead — and keep it — in whatever field they happen to get into is clearly evident. It can be seen with both Sonny’s Place and GreatHorse, which came to fruition the same way the trash and horse-racing ventures did — through vision and a lot of hard work. And a conversation at the dinner table, said Guy, who vividly remembers this one regarding that old, run-down driving range the family acquired a dozen or so years ago and what might be done with it. • 2008: Arlene Kelly and Kim Sanborn, founders of Human Resource Solutions and Convergent Solutions Inc.
• 2002: Timm Tobin, then-president of Tobin Systems Inc. They did, and from those humble beginnings — miniature golf and a food truck with ice cream — new additions have been added seemingly every year since. Go-karts and batting cages came next, followed by a full restaurant, an arcade, a pavilion, rock-climbing walls, laser tag, miniature bowling, virtual reality, live concerts, and more. 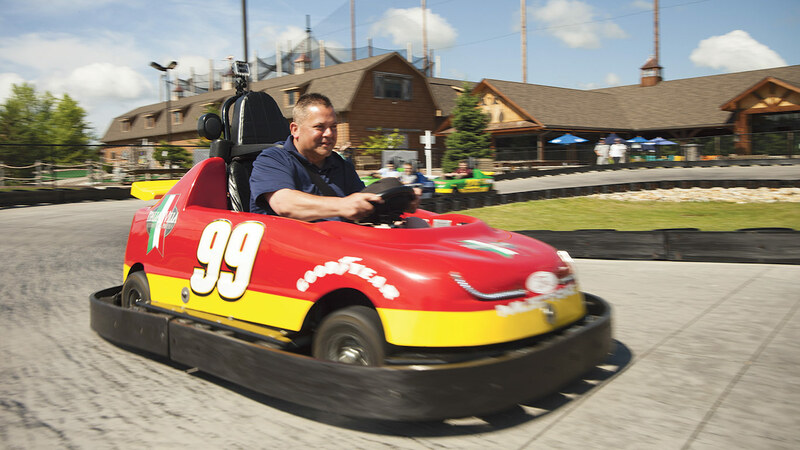 The facility has become a destination not just for families, but for a growing number of companies looking to host outings or team-building exercises. The business plan, unofficial in nature, has always been to continually build on the foundation and — in keeping with the tone of those original conversations — keep looking for new ways to utilize a large and highly visible tract of land. 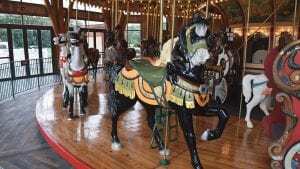 The latest manifestation of this philosophy was the addition, in 2017, of a carousel with a long and proud history and, yes, a number of handsome horses. Built by the Philadelphia Toboggan Company in 1925, the ride’s first home was Delaware Beach. It then had a lengthy stay at Lakewood Park in Waterbury, Conn., and then, after refurbishment, at Kiddieland Park in Melrose, Ill. It was languishing in a storage container at Chicago Land when Guy’s father, Jerry, the main driver in the creation and continued growth of Sonny’s Place, found it and concluded that it was the next big piece in the puzzle. 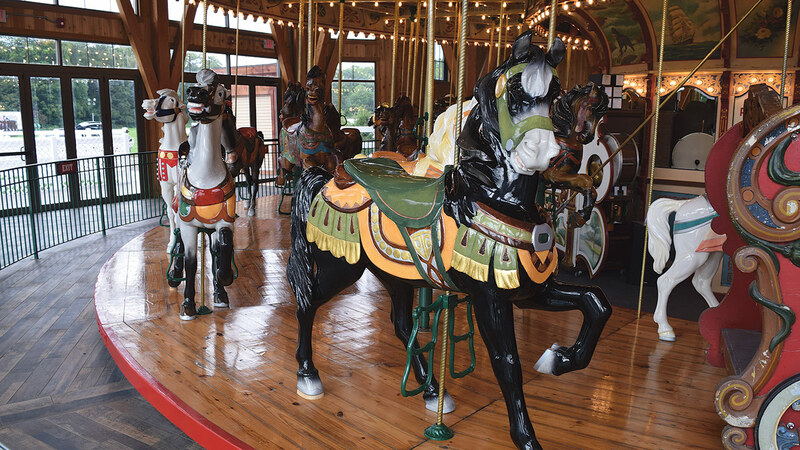 The same can be said of Greathorse, which, like the carousel — and the old driving range itself — was a restoration effort that required some vision, and then some capital and a good business plan. As Guy — who turned pro and played on a few of golf’s mini-tours before coming to the realization that the big stage was beyond his skill level — recalls the story, the family actually started looking for a golf course to buy nearly 20 years ago to further diversify the family business beyond trash and horses. 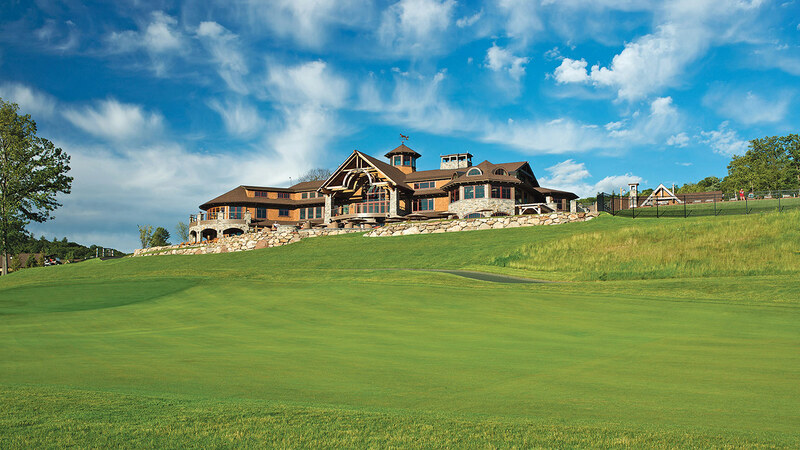 The search was put aside, especially as Sonny’s Place was being developed, and then taken up again at the start of this decade, with a number of options in play before settling on the former Hampden Country Club, then heading for the auction block. “We could see that it had a lot of potential, but also a lot of scars to it,” he recalled. “What sold the place was the view, and we knew that, with some vision and some work, the place could be something. Frank M. says he can’t recall not being in business or entrepreneurial. Indeed, while he was involved with the family businesses, in some capacity, since he was teenager, he was also looking to hang out his own shingle, and did, at age 15. The venture — born from another of those Sunday afternoon conversations at the dinner table — was called College Bound Cleanups, a “concierge-type service for old ladies who needed their basement cleaned out, or their garage. 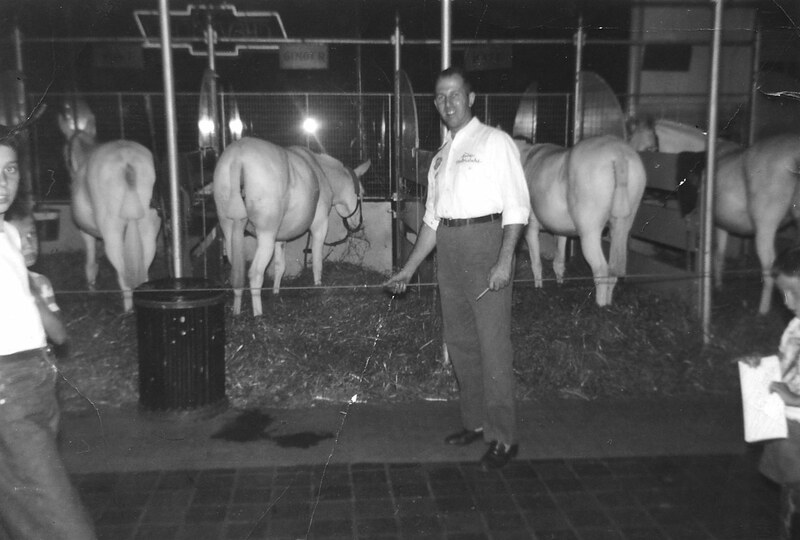 Like the generations that came before him, he added, noting that he eventually put his own venture aside and focused on horses and trash, sometimes in that order, sometimes the other. And there was, and is, always talk about new opportunities and paths to go down, like Sonny Antonacci projecting a need for bottled water. 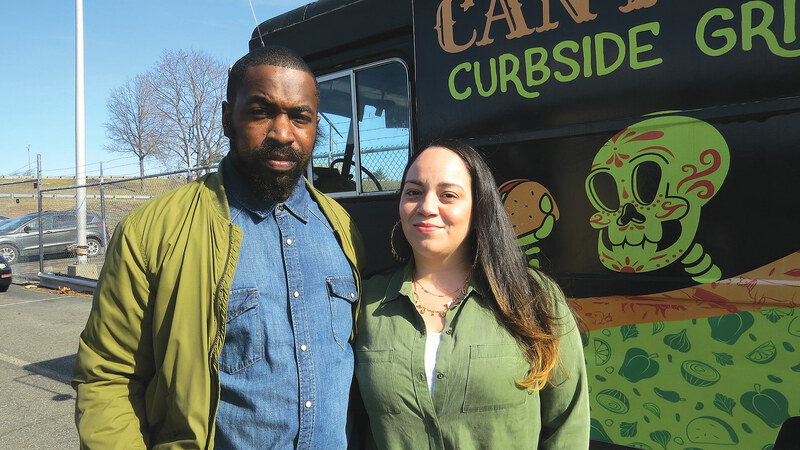 “Business … it’s part of every conversation we have,” said Frank, referring to the family’s entrepreneurial DNA and a passion for finding and developing new business opportunities. And these traits have been passed down from one generation to the next. Frank can even see it in his young children. 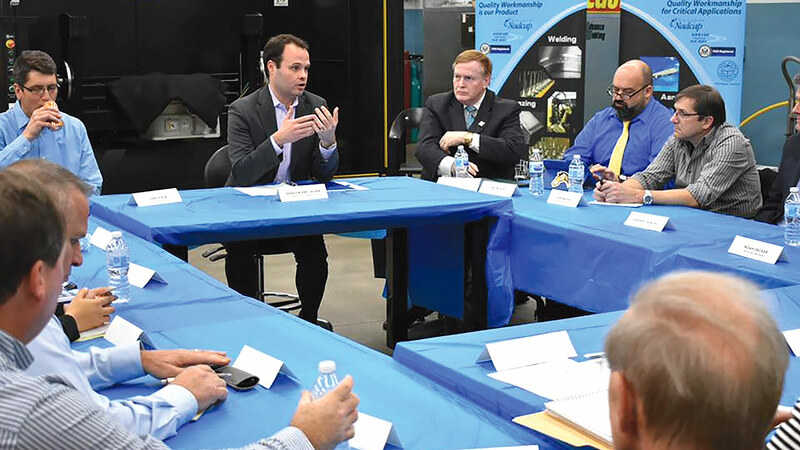 Within the Antonacci stable of enterprise, business works maybe a little differently than in most places, said the third-generation spokespeople. “What people have a hard time understanding about our business and our family is that it’s different — I call it ‘sloppy,’” said Frank, who understood that he needed to explain that term and did. 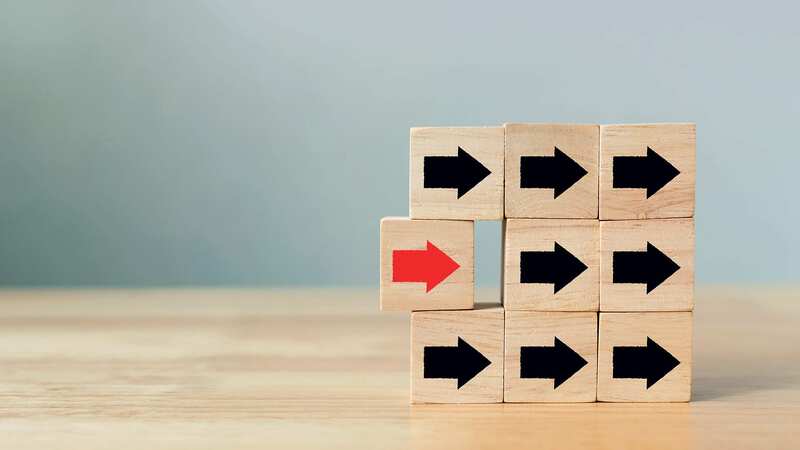 ‘Loose.’ ‘Sloppy.’ ‘Unorthodox.’ Whatever it is, it seems to be working, and in the traditionally challenging setting of a multi-generational family business, or set of businesses, to be more precise. There are actually four generations still involved. Indeed, Frankie and Guy said their fathers, Frank and Jerry, have breakfast with their mother every morning. “And they’re probably running things by her every day,” said Frank M.
The second generation, as noted, remains passionate about all aspects of the business operation, but especially the horse breeding and racing, they said. Meanwhile, there are many third-generation members involved, or soon to be involved, including Guy’s brother Matthew, 24, and Frank’s brothers, Chris and Phillip. Overall, said both Guy and Frank M., the generations have worked well together, and each has been allowed to make their mark — and their own contributions. ‘Sonny’ Antonacci never did get into the bottled-water business, his sons having persuaded him that there was no future in it. That’s family lore, anyway. Indeed, while the Antonacci family never became part of the multi-billion-dollar bottled-water industry, it has certainly had far more hits than misses. In business, as in harness racing, it has found the winner’s circle far more often than most. 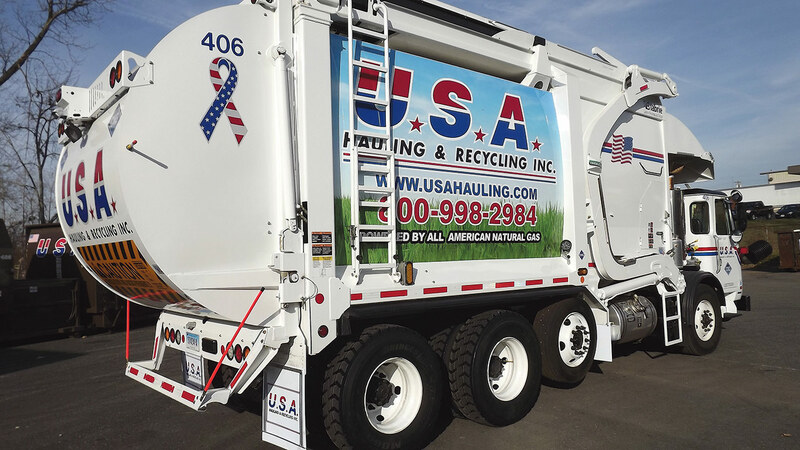 Having capital from the trash business has certainly helped, but so too has been the ability to see other opportunities where others did not, having true entrepreneurial spirit — and, yes, being kind but also aggressive. ‘Sonny’ had all those attributes, and so have the generations that have followed him. 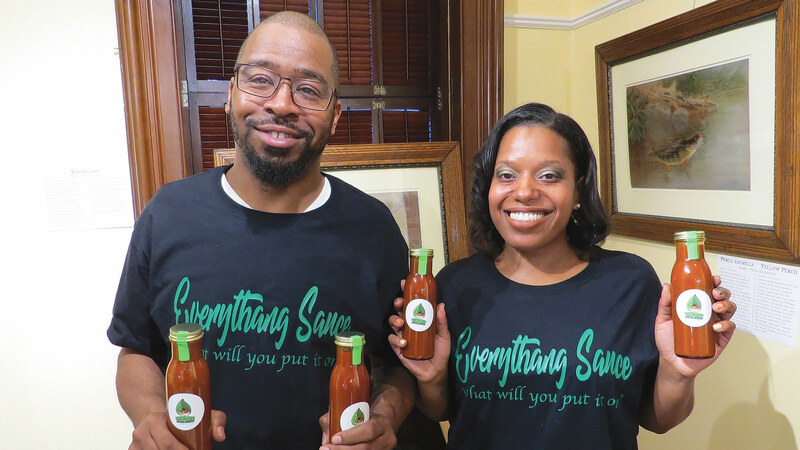 That’s why this family is BusinessWest’s Top Entrepreneurs for 2018. “We’ve been hearing this for years, but it had just reached a boiling point.” That’s how Kermit Dunkelberg chose to sum up the conversation in this region regarding how many individuals lack the soft skills and the essential skills needed to be workforce-ready. This ‘boiling point’ status helped inspire a regional response to a request for proposals for state funding — and a $247,000 grant aimed at putting more qualified workers in the pipeline. 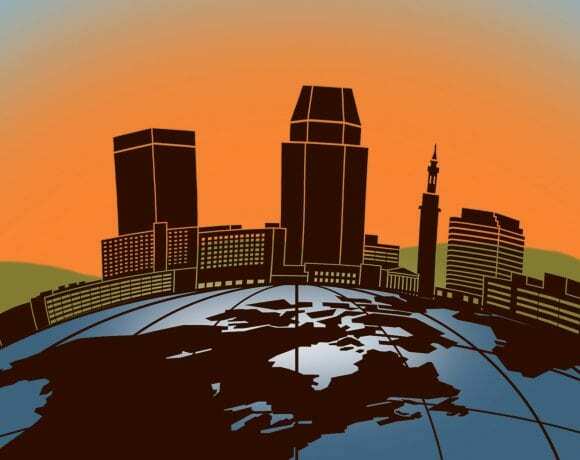 Since the end of the Great Recession, nearly a decade ago now, the region’s economy has been in a slow-but-steady expansion mode characterized by growth in most all industry sectors and almost historically low unemployment. 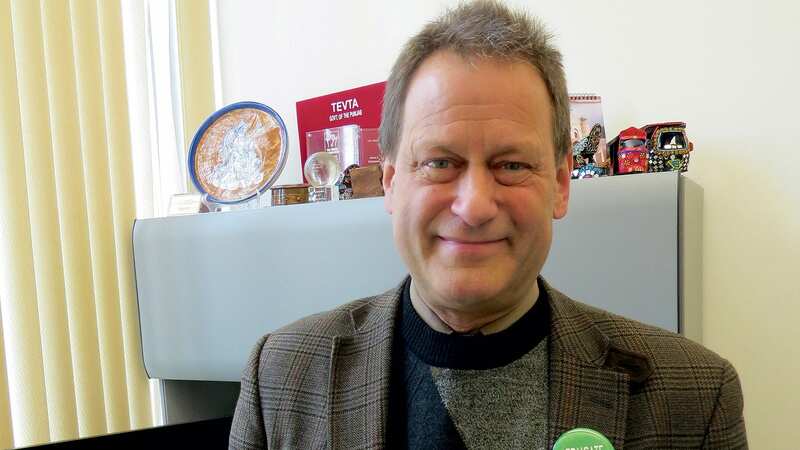 It’s been a good time for employers and job seekers alike, but there are some who have just not been able to take part in this improved economy, said Kermit Dunkelberg, assistant vice president of Adult Basic Education and Workforce Development at Holyoke Community College (HCC). These individuals are sitting on the sidelines and not getting in the game for a number of reasons, but the two most common denominators — and this is across the board, in all sectors of the economy — is that they lack hands-on experience in a given field, basic job-readiness skills, or both. “And in many cases, it is both,” said Dunkelberg, who noted that a soon-to-be-launched, HCC-led project will address both of these concerns. • Some kind of work experience with a local employer. That list of partners includes Greenfield Community College and Springfield Technical Community College; the MassHire Hampden County Workforce Board; the MassHire Franklin Hampshire Workforce Board; the MassHire career centers in Holyoke, Springfield, and Hampden, and Hampshire counties; and several local employers — University of Massachusetts Auxiliary Dining Services in Amherst, the Log Cabin Group in Holyoke, MGM Resorts in Springfield, Peerless Precision in Westfield, and BETE Fog Nozzle in Greenfield, which have agreed to provide internships, apprenticeships, or job-shadowing opportunities to program participants. That long list of players speaks to the breadth and depth of the problem and the need for a regional solution, said Dunkelberg, adding that the TRAIN initiative is an ongoing state program, and when area agencies and institutions mulled whether to apply for grants individually or collectively, there was a clear consensus for the latter. “We brought these partners together, and one of the questions on the table was, ‘should we develop one proposal for the region, or should we develop competing proposals — what do people want to do?’” he recalled. “There was a very strong feeling that we should collaborate and develop a proposal jointly, across the entire Pioneer Valley. As noted earlier, there are three components to this project — pre-training, industry-specific training, and work experience with an area employer, and all three are critical to individuals becoming able to shed those classifications ‘unemployed’ or ‘underemployed,’ said Teri Anderson, executive director of the MassHire Hampshire Franklin Hampshire Workforce Board. The job-readiness component will focus on a number of skills lacking among many of those on the outside looking in when it comes to the job market, she said, including communication skills, teamwork, customer service, basic math, reading, and computer skills, along with financial literacy, job-search skills, and more. Kermit Dunkelberg says the TRAIN initiative will provide participants with not only job-readiness skills, but also hands-on experience in one of several fields. Such skills will be provided through 60-hour pre-training courses, after which participants will have the opportunity to continue into an industry-specific training program — a four-week, 120-hour program in culinary arts and hospitality at the HCC MGM Culinary Arts Institute, or a 44-hour manufacturing training program at STCC. Also, participants might instead choose to enter another industry-specific training program offered by one of the community colleges. The objective is make people currently not ready to enter the workforce better able to do so, said David Cruise, executive director of the MassHire Hampden County Workforce Board, adding that employers in every sector of the economy are challenged to find qualified workers, and in some fields, especially manufacturing, their inability to do so is impacting their ability to grow. For this issue and its focus on employment, BusinessWest takes an in-depth look at the TRAIN-funded program and its prospects for becoming a model for helping regions like this one enable individuals to become part of the ongoing economic expansion, rather than merely spectators. Both terms are used to describe what happens when public benefits programs phase down or out quickly, leading to an abrupt reduction or loss of benefits for families as household earnings increase through employment, but have not increased enough for self-sufficiency to be reached. Often, just a small increase in household earnings can trigger loss of eligibility for a benefit, making a family substantially worse off from a self-sufficiency standpoint than prior to the earnings gain. And fear of this eventuality is enough to keep many individuals from trying to enter or re-enter the workforce, said Anderson, adding that understanding and managing the benefits cliff will be an important component of the pre-training aspect of the TRAIN program. And while it’s difficult to do so, this situation can be managed, or better managed, she told BusinessWest, adding that the state Department of Transitional Assistance is in the process of revising some of its procedures in an effort to ease the cliff effect, and the TRAIN program will help communicate these changes. And that’s one example of how this program is necessarily broad in scope to address the many barriers to employment and reasons for underemployment in this region, said Dunkelberg. Overall, and as noted earlier, the TRAIN initiative is a proactive response to a persistent and statewide problem, he noted, adding that it was launched in 2016 to engage long-term unemployed adults, offering foundational education programs, wraparound support services, and industry-specific skills that would enable entry or re-entry into the workforce. The first funding round resulted in a number of specific training and employment pilot programs, he went on, adding that, locally, the program funded an initiative involving HCC and STCC to train and place individuals as home health aides. The program was not funded in 2017, he went on, adding that by the time the next RFP was issued earlier this year, the conversation in this region had changed somewhat. Alyce Styles, dean of Workforce Development and Community Education at Greenfield Community College, agreed, and said surveys of area employers leading up to the grant proposal revealed that job seekers in the manufacturing sector and many others were lacking many of what are often referred to as the ‘soft’ skills needed to succeed in the workplace. The latest TRAIN initiative, proposed with the goal of creating a model for other regions, will involve up to 120 individuals from Hampden, Hampshire, and Franklin counties, and is relatively short in duration — until only next June. Over the next six months, the regional career centers are slated to develop three-week, 60-hour ‘essential skills/job readiness’ pre-training courses that will be offered at least four times at locations in the three Pioneer Valley counties. Dunkelberg said the area career centers will soon commence recruitment of individuals for the program, adding that they are likely to come from several different pools, if you will, each facing some unique challenges, but some common ones as well. Older workers finding difficulty re-entering the workforce comprise one constituency, said Anderson, adding that there are more people in this group than the announced unemployment rates might lead people to believe, because the numbers generated by the state do not count those who have become discouraged and have thus stopped looking for work. “A lot of the people we see here are older workers who have been laid off, and they’re having trouble becoming re-employed,” she said, adding that other likely recruits face barriers to employment that include everything from lower educational attainment to a lack of basic transportation. “There are many people who want to work and are ready to work, but they can’t get access to the training or to job sites because they can’t afford a private vehicle and public transportation doesn’t get them there,” she said, adding that the grant provides for some bridge transportation and child-care services so individuals can take part in the training components of the program, and agencies will explore options for keeping such services available to individuals if and when they do find work. Cruise concurred, and told BusinessWest that, in addition to transportation issues and the benefits cliff, many of those on the outside looking in are simply not ready for prime time. “Two of the industries we’re identified as high priorities over the next five years are advanced manufacturing and culinary and food service,” he explained. 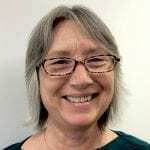 “At MassHire, we offer a number of training programs — as does Holyoke Community College and Springfield Technical Community College — in those two areas. And whenever we go out to look for potential applicants for those seats, there are some who, from an academic perspective or a language perspective, just aren’t ready for the rigors of a 14- or 15-week intensive program. Dave Cruise says the TRAIN initiative is designed to help those who are unemployed or under-employed, and are thus on the outside looking in when it comes to the job market. Beyond the needed basic job-readiness skills, many of those still unemployed or underemployed need hands-on experience in a chosen field or exposure with different fields so they can better decide on a career path. The TRAIN program will provide these as well, said Dunkelberg. In response to these realities, the program will provide some hands-on exploration of culinary and hospitality careers, primarily because of the many opportunities now opening up in that field across the region, and also in manufacturing, another sector where there are jobs coming available and not enough people in the pipeline. This exposure will take a number of forms, including internships, job-shadowing experiences, and actual employment, said Dunkelberg, adding that the various employer partners, from MGM to Peerless Precision, have agreed to provide some type of hands-on experience with the goal of helping participants both understand where the opportunities are and discover if these fields are good fits. When asked if there was a model for what the many partners involved in this initiative are working to create, Dunkelberg said the goal is to build a model for others to use. And that’s just one of many potential quantitative and qualitative measures of success when it comes to this program. Others include everything from the number of job interviews granted to the program participants — a low bar, to be sure — to growth in enrollment in academic programs such as GCC’s CNC course of study, to ultimate progress in closing the nagging skills gap in this region. That gap won’t be closed easily or soon, but movement in the right direction is the goal — and the priority — at the moment. As Dunkelberg noted, the problem has reached a boiling point, and the TRAIN initiative, a truly regional response to the problem, will hopefully help matters cool down considerably. 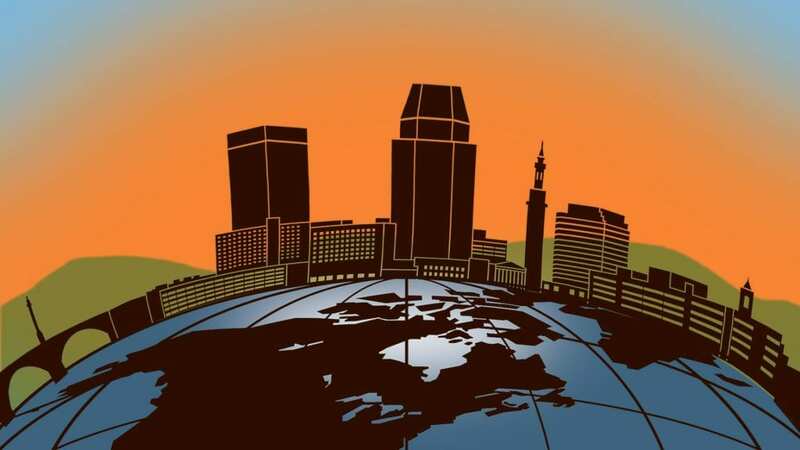 By doing so, more people in this region — and probably others — can then take part in the economic expansion of which they have only been observers.